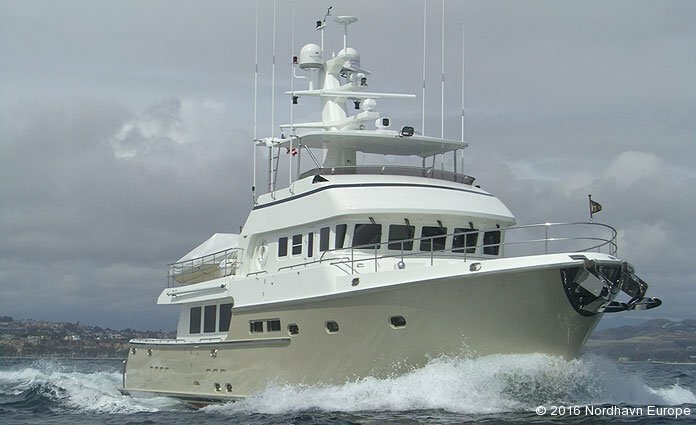 Nearly a year was spent in the tooling and mold-building phase of this project to create the hundreds of highly polished molds required to construct this complex boat in gleaming gel coat finished GRP (fiberglass) construction. 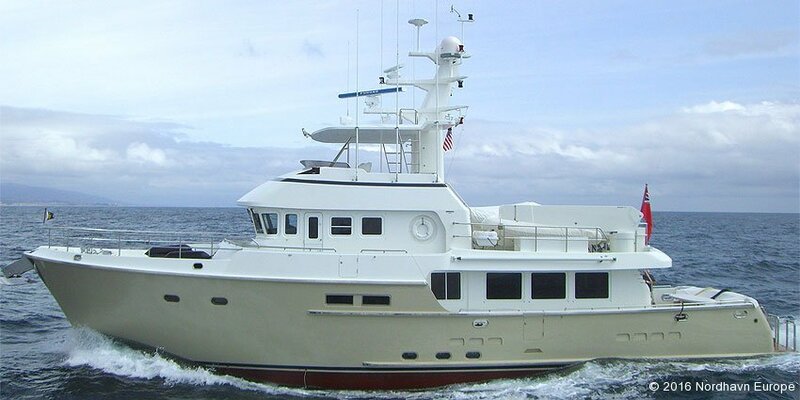 With popularity of the “northwest trawler”-style boat on the rise, PAE set out to create a new, big modern passagemaker that fused this salty look with the advanced systems of the latest Nordhavns. 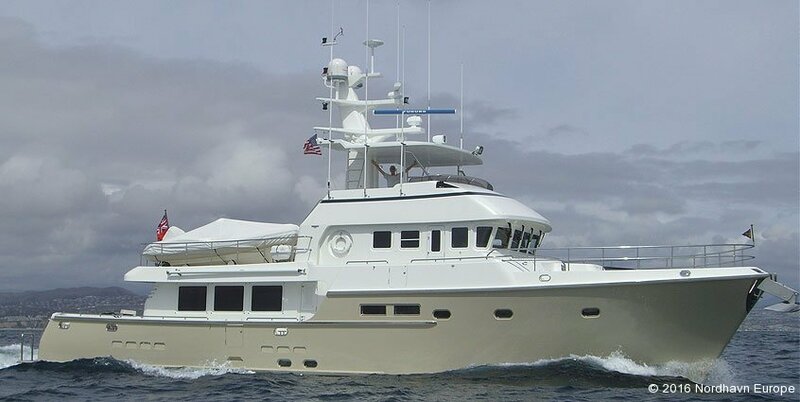 The result was the Nordhavn 76: developed for those yachtsmen who want an aft pilothouse boat which carries its shore boats on the foredeck. 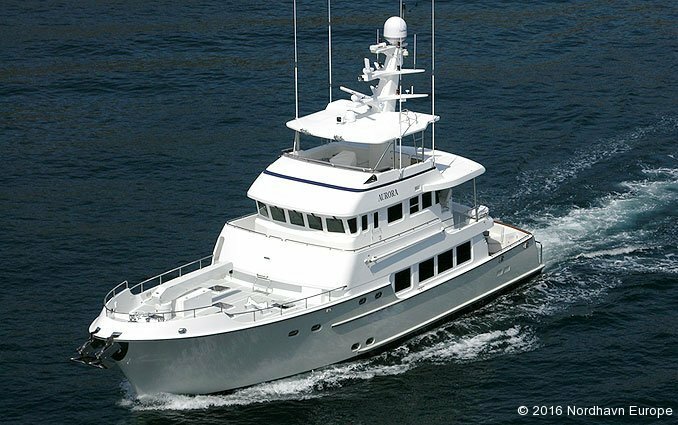 Like our venerable Nordhavn 62, the pilothouse of the N76 is set aft, carries its crane forward and can launch its shore boats off either the port or starboard side. 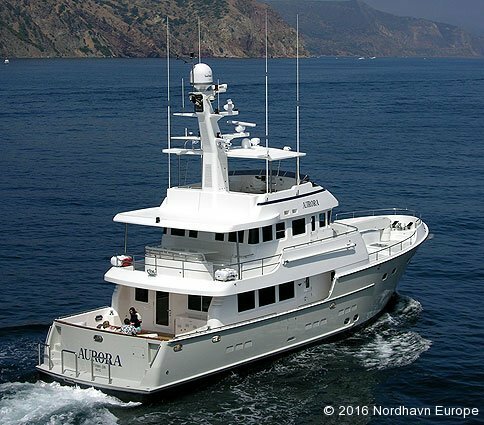 Based on the hull form and specifications of the N72, the simple goal of this new model was to create a small superyacht which was true to the rugged ocean going heritage of other Nordhavns while at the same time stunning in her elegance, fit and finish, systems and engineering. 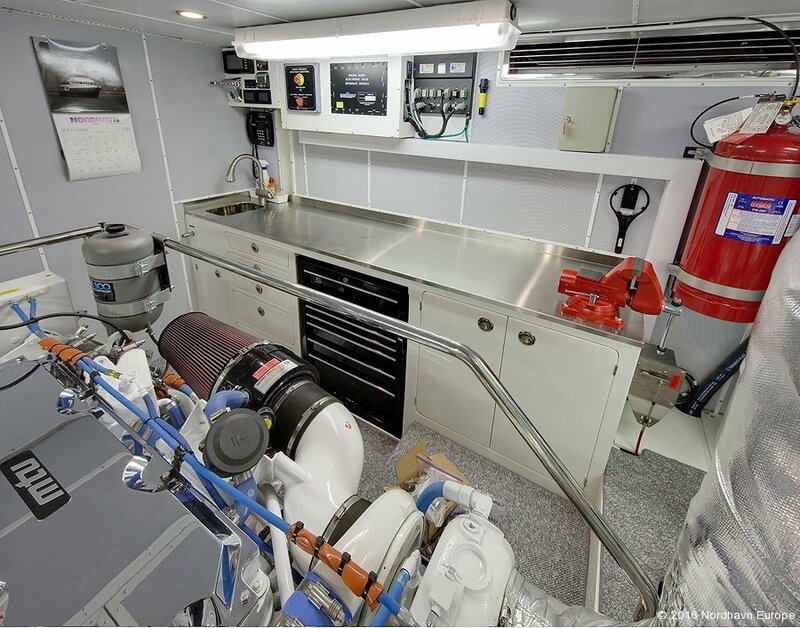 The boat was taken from drawing board to factory seamlessly through the efforts of Naval Architect Jeff Leishman, along with the design and engineering team at PAE, and the Taiwanese builders at our partner factory, Ta Shing. 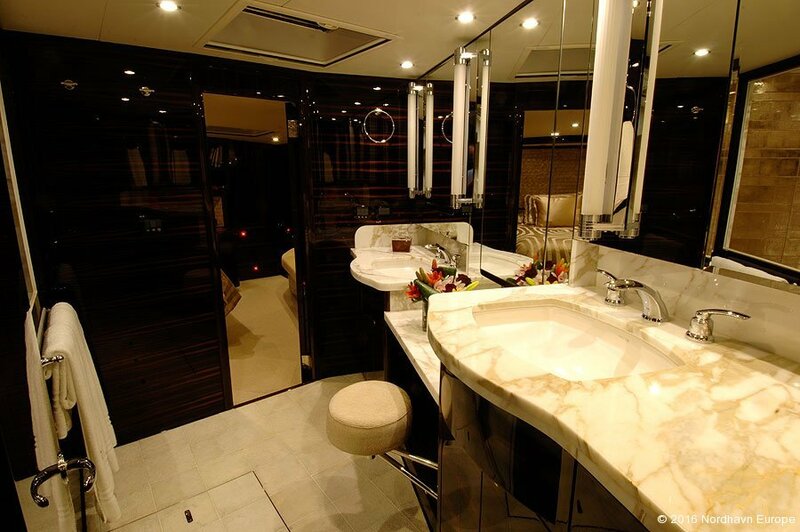 The final product has exceeded everyone’s goals. 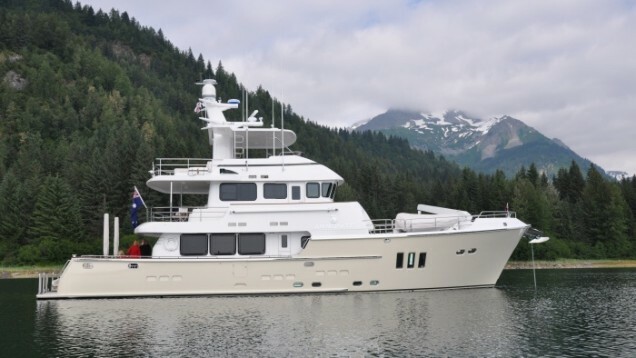 The Nordhavn 72 took PAE to the next level and the 76 has taken off from there. 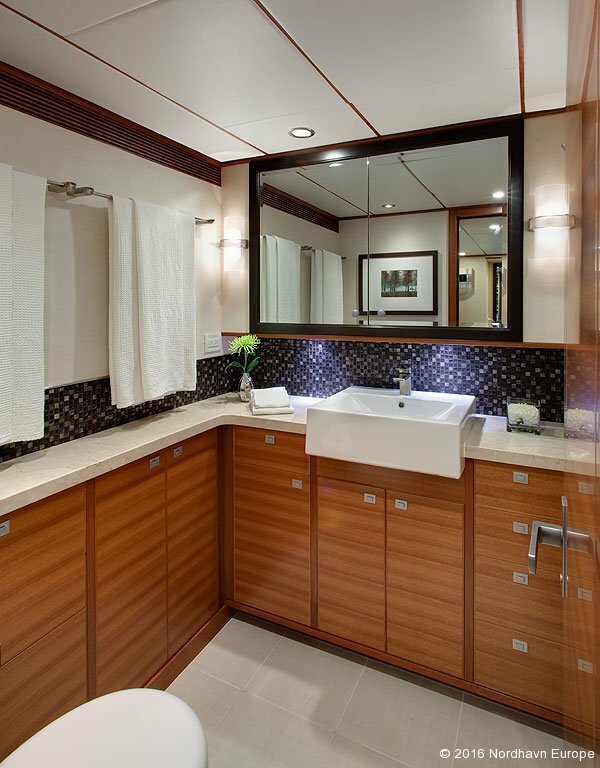 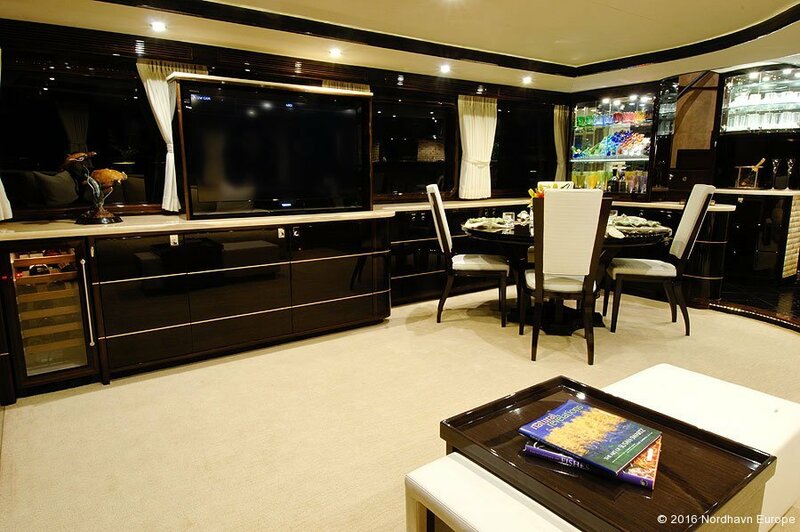 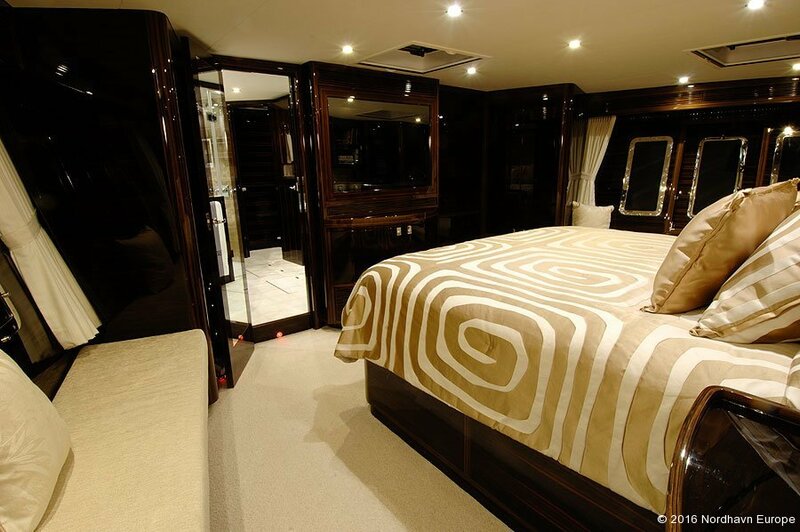 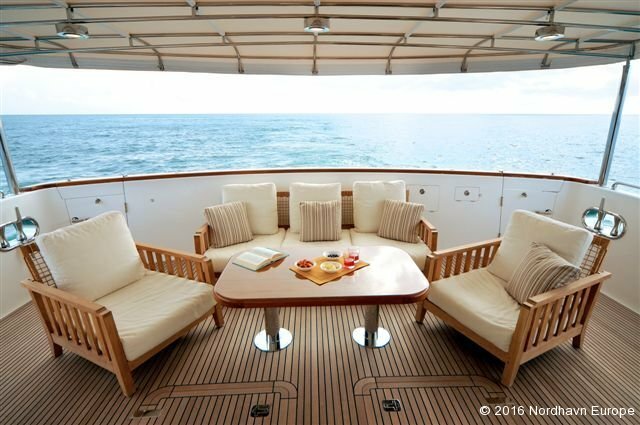 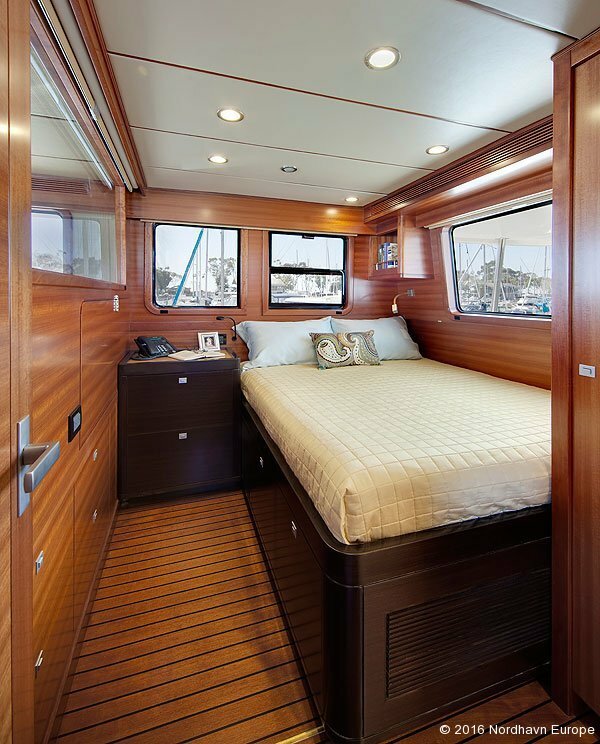 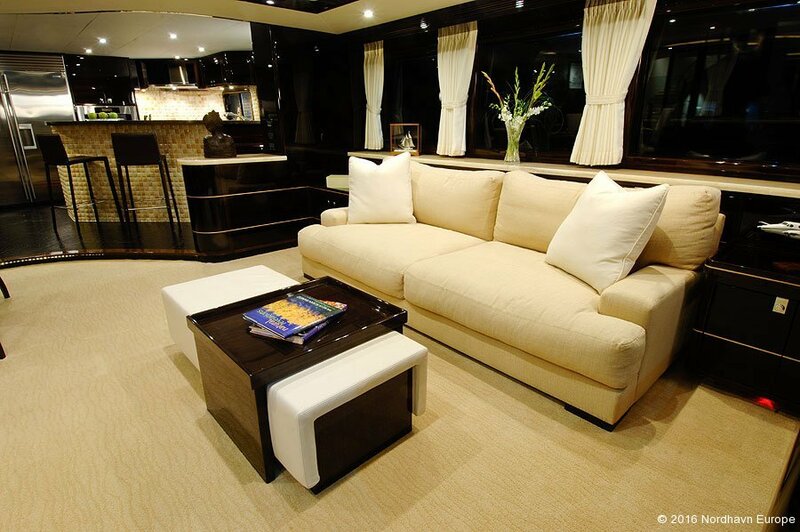 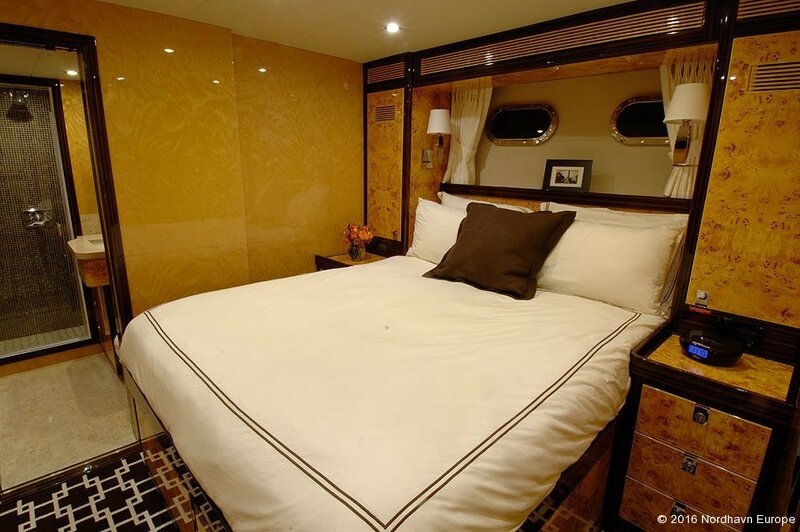 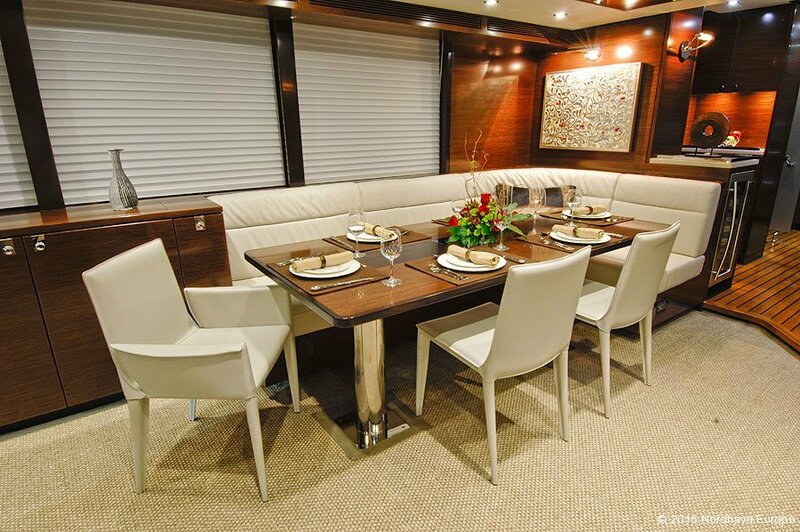 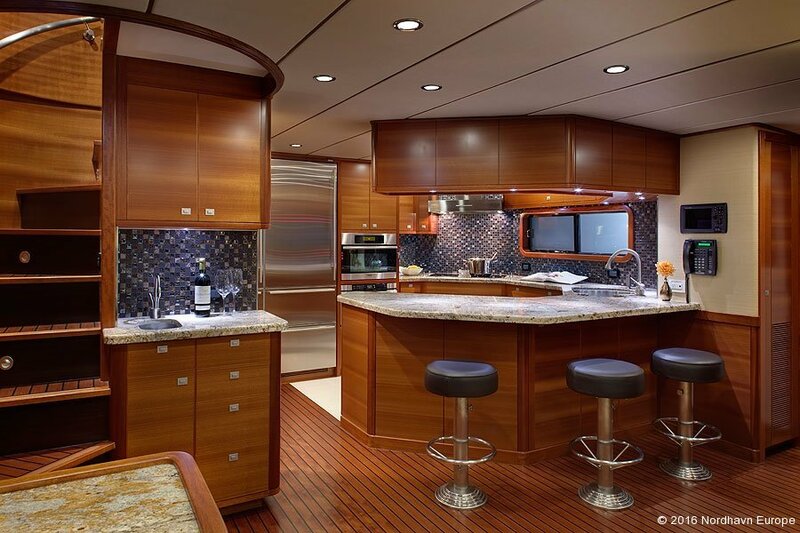 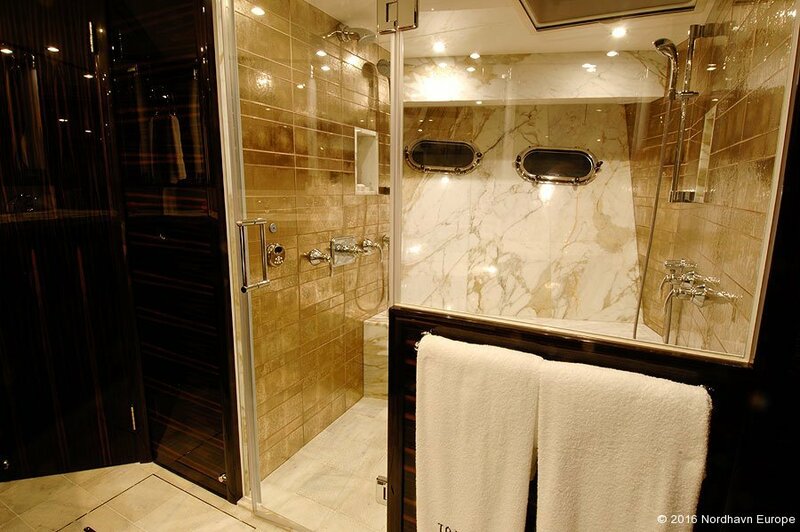 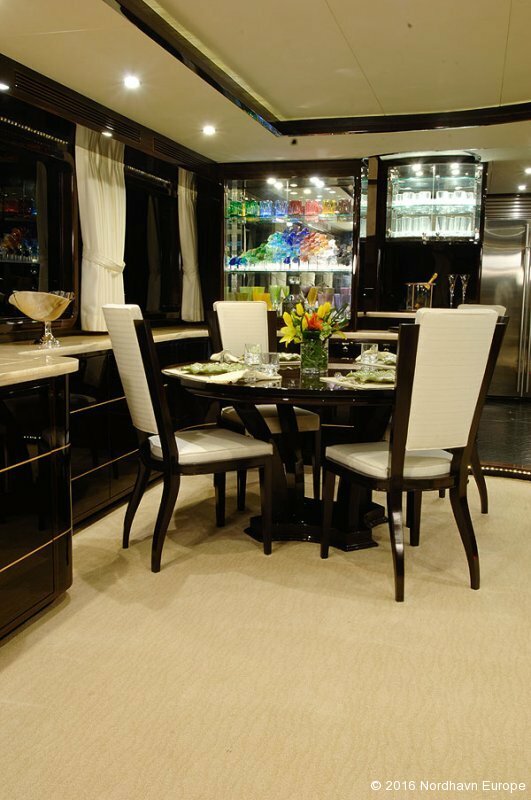 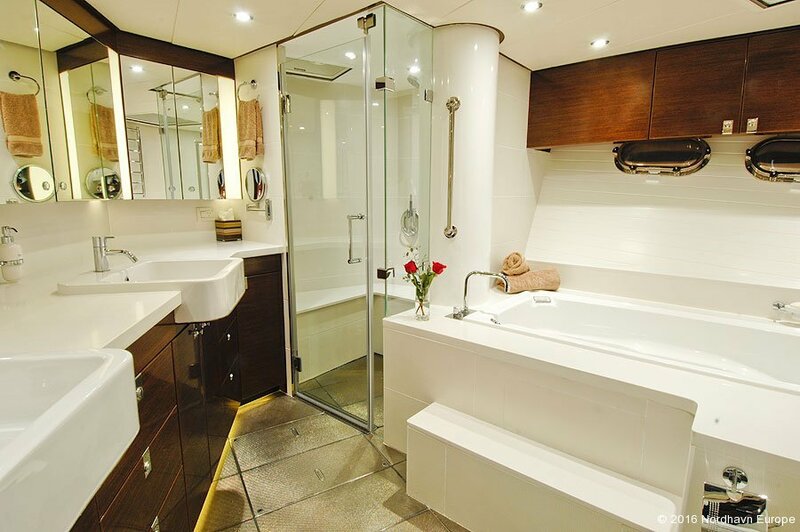 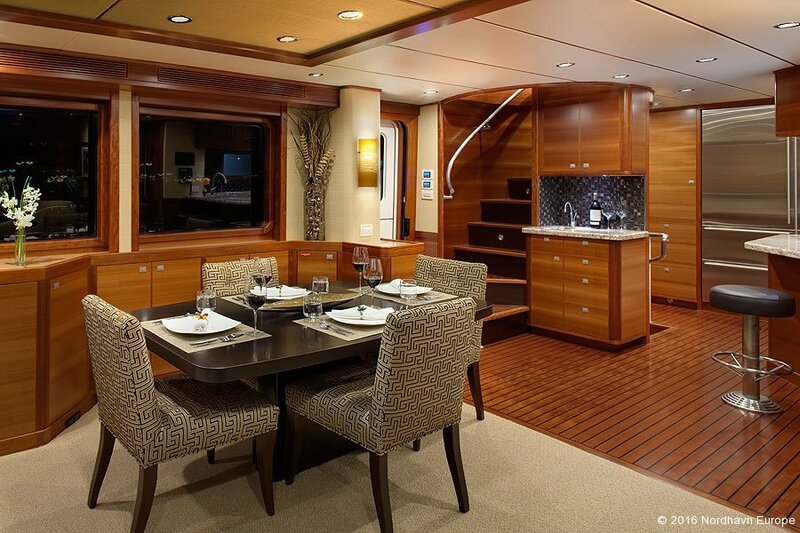 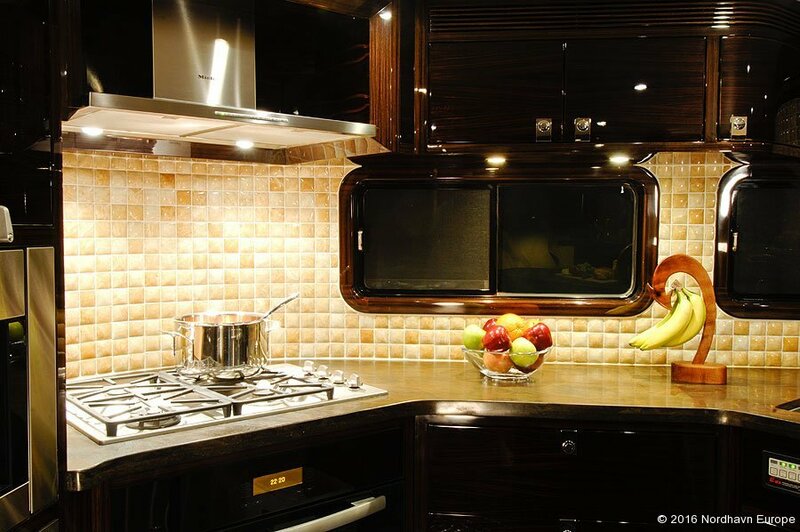 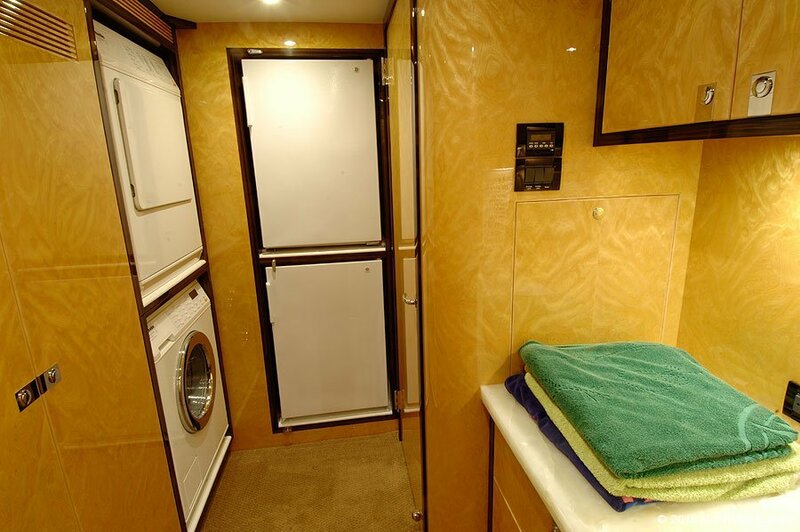 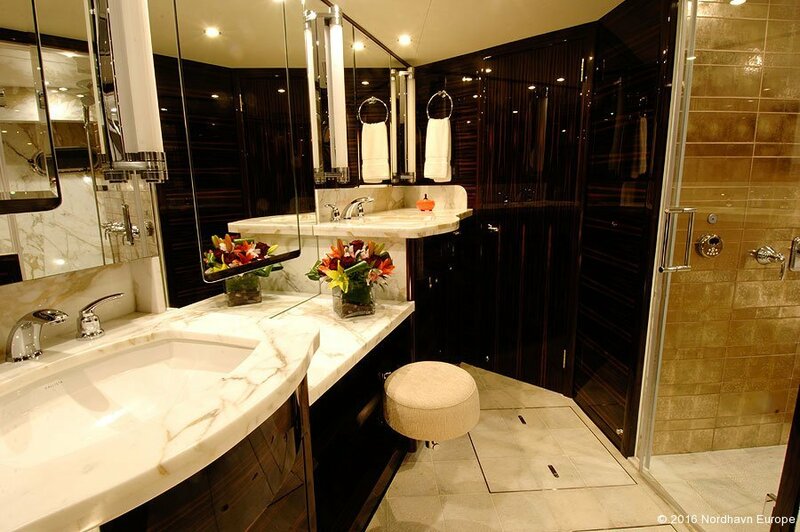 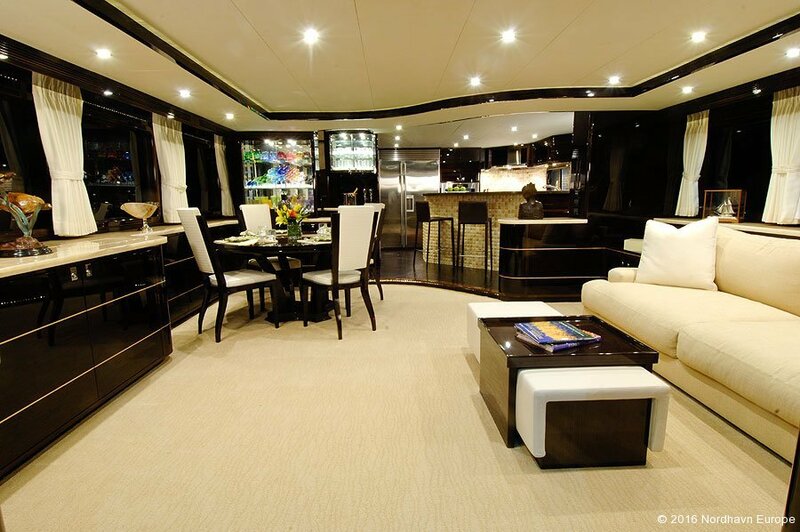 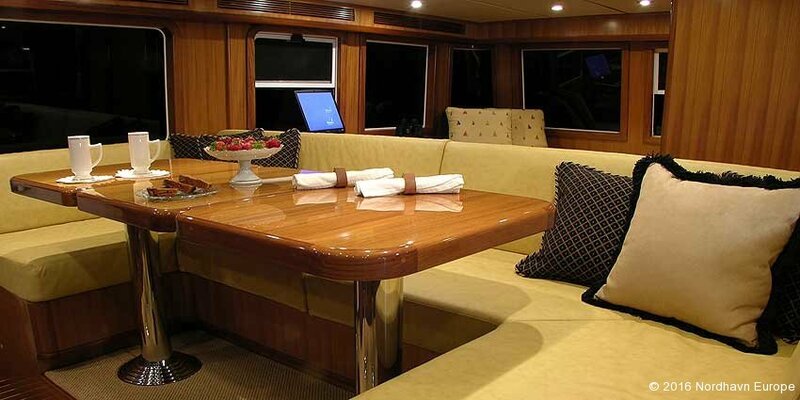 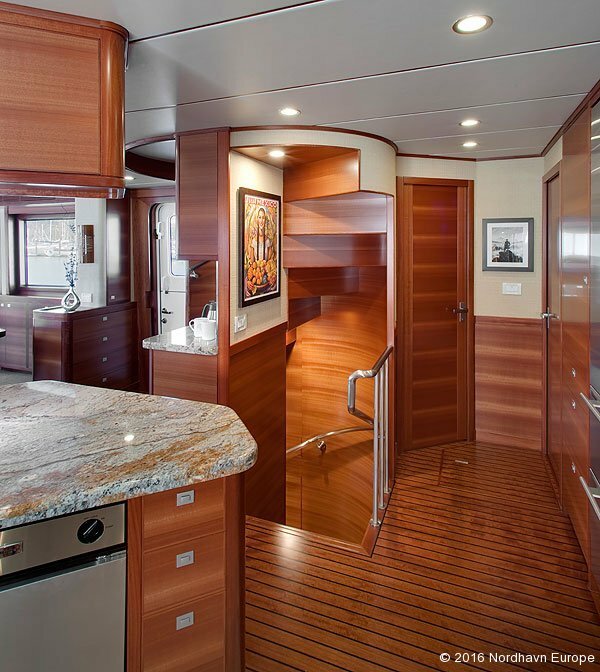 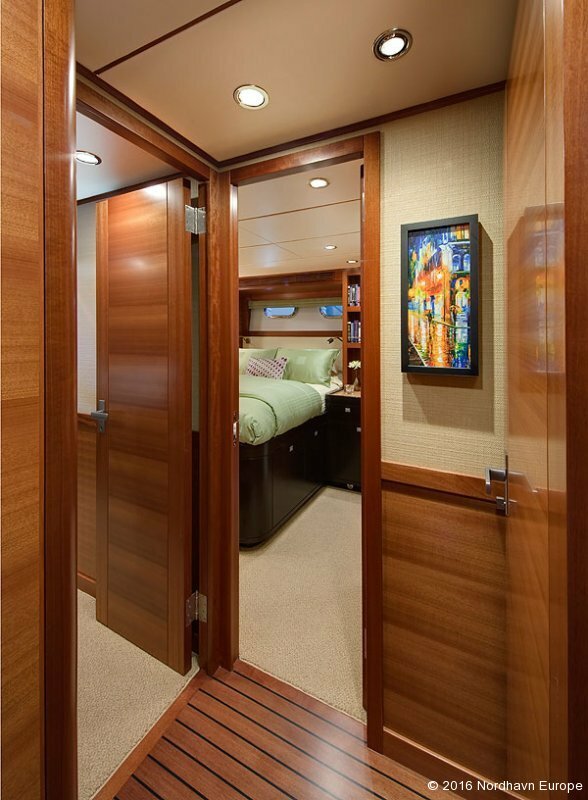 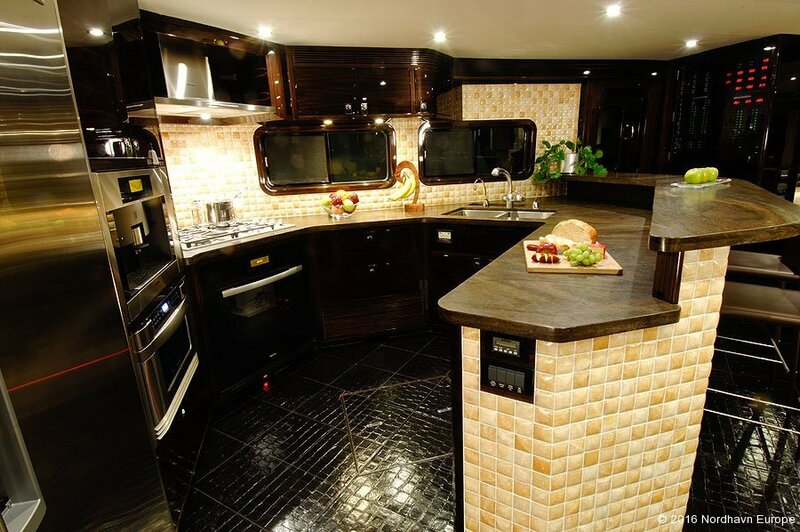 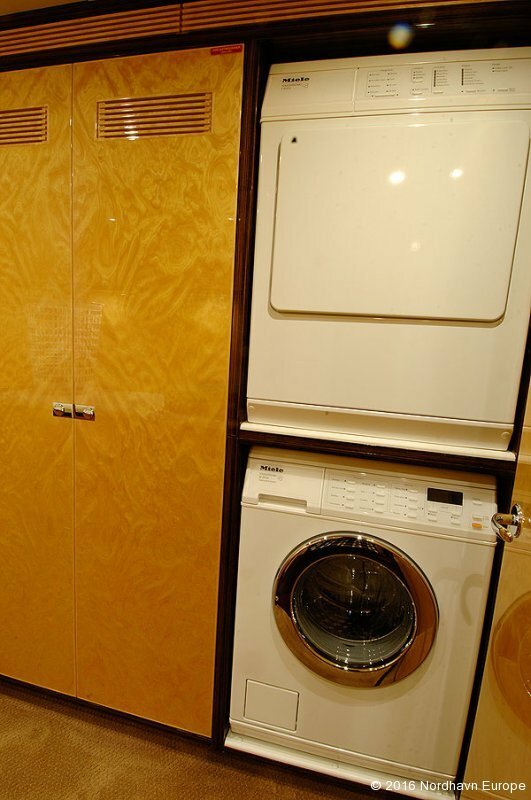 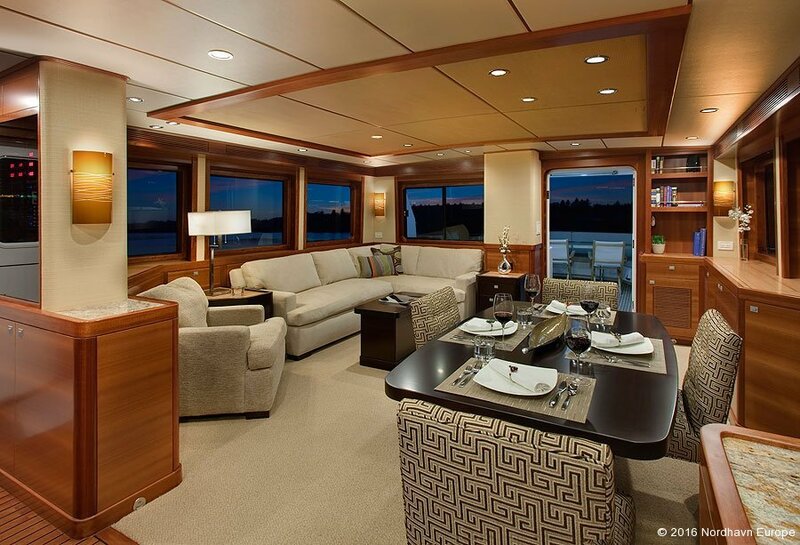 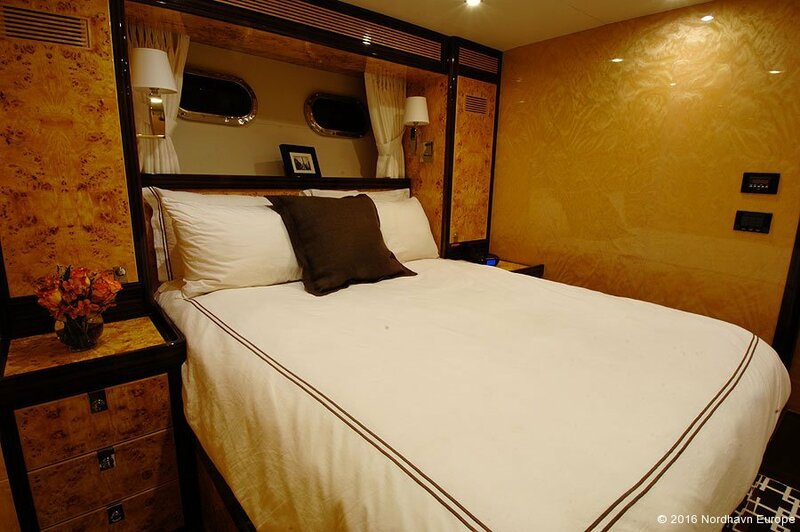 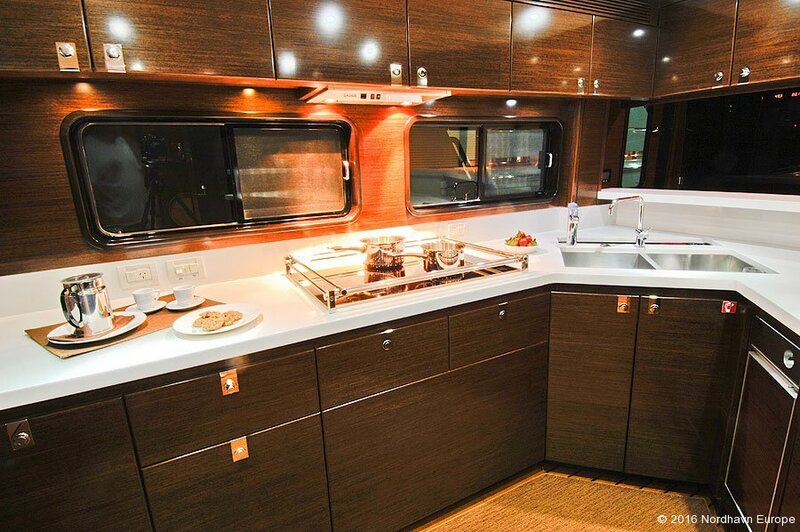 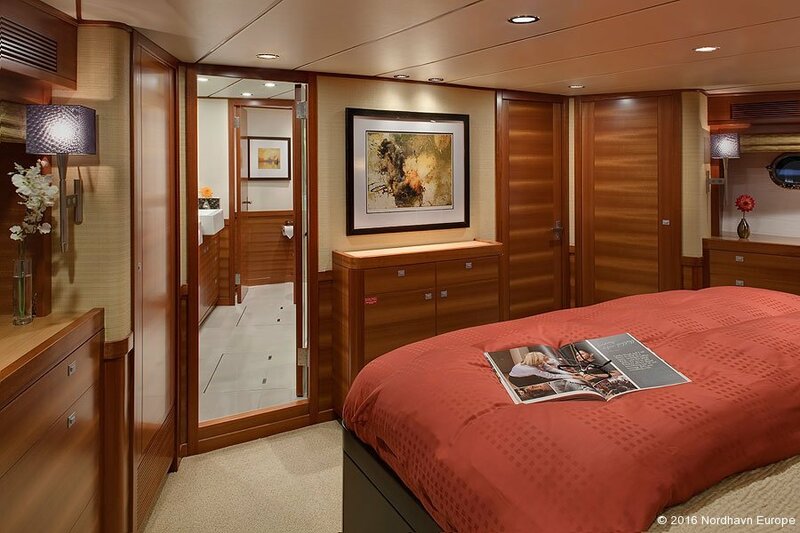 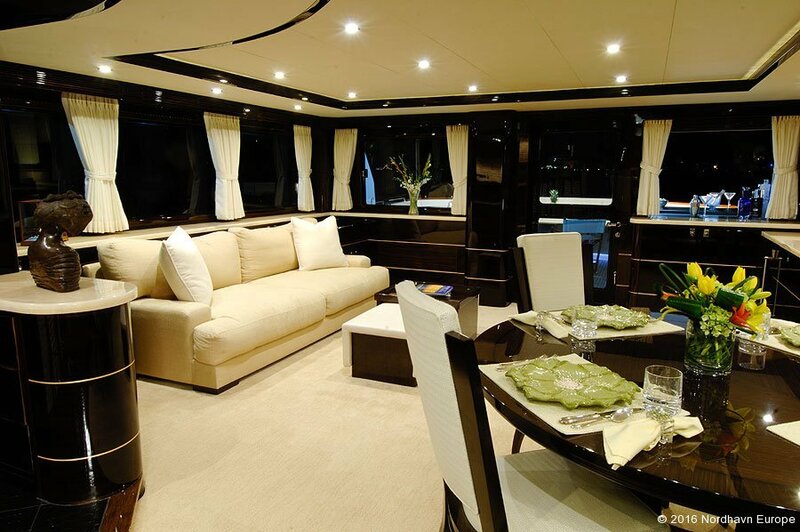 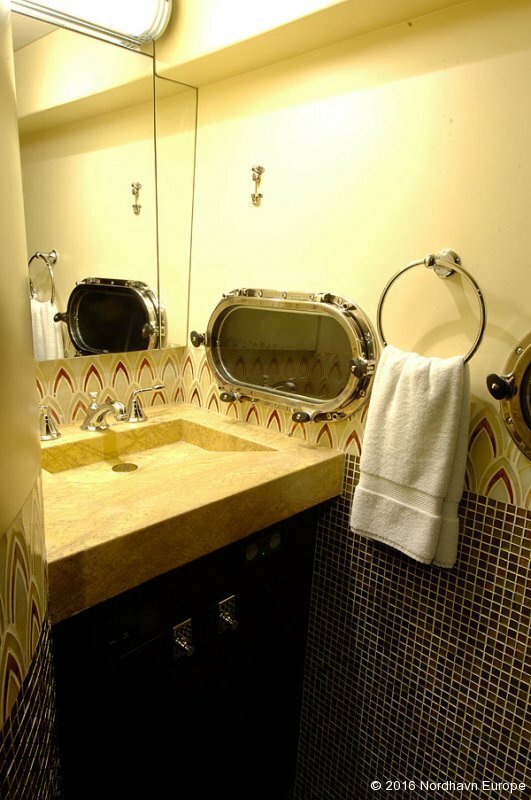 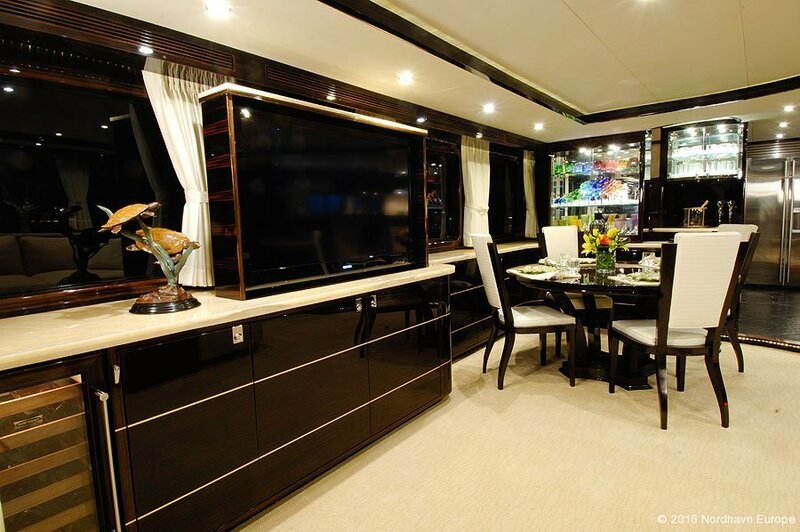 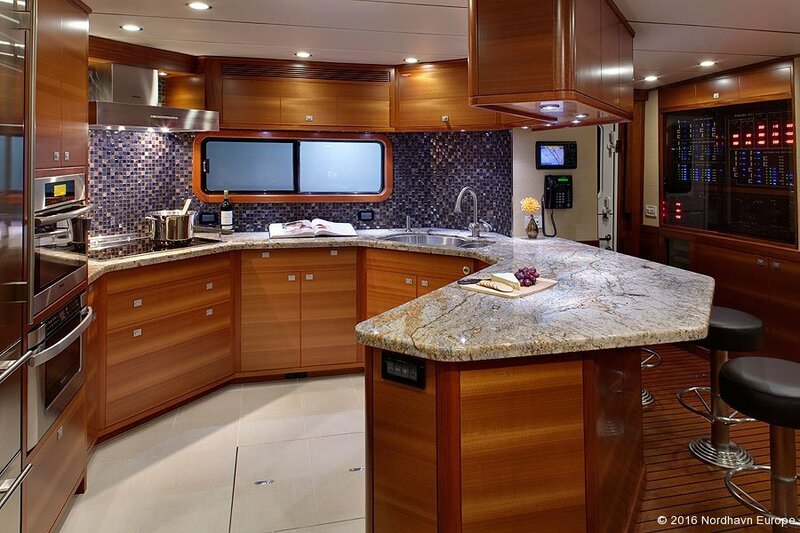 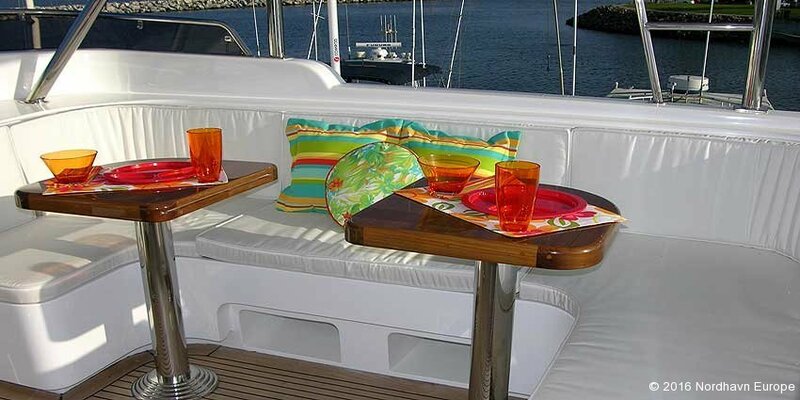 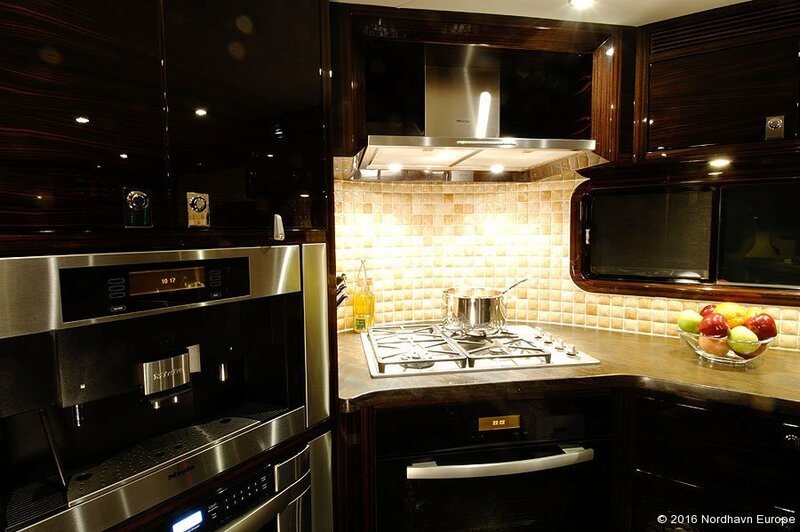 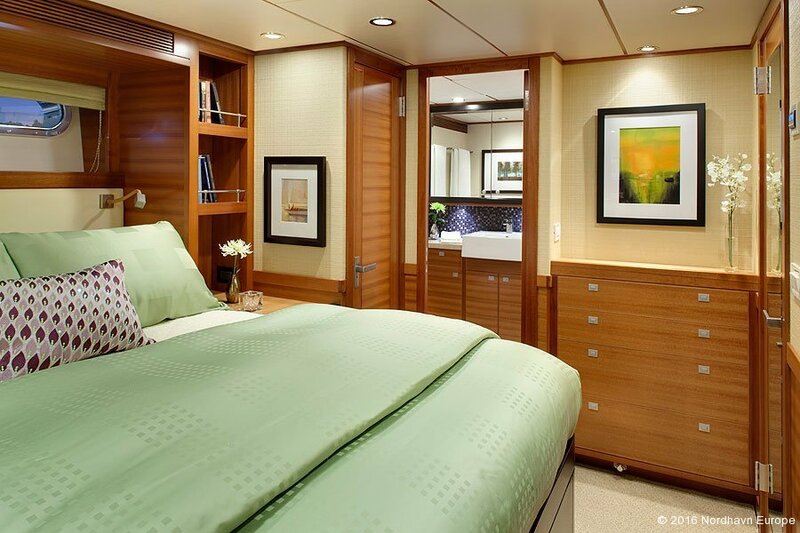 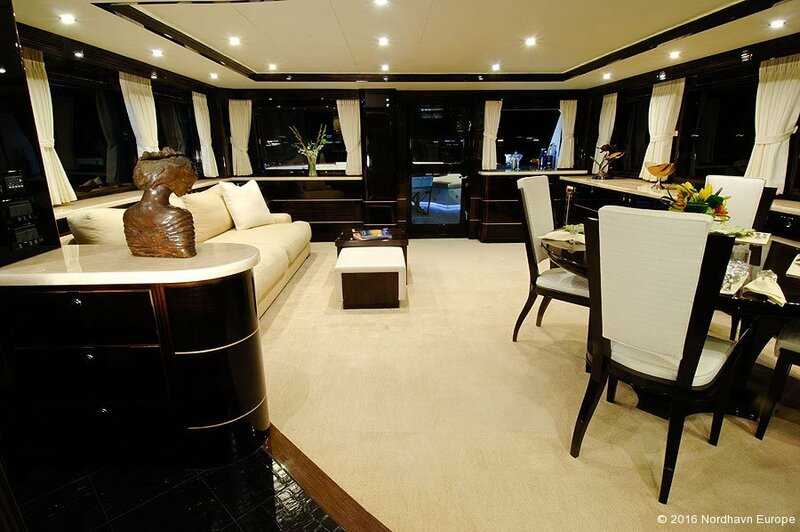 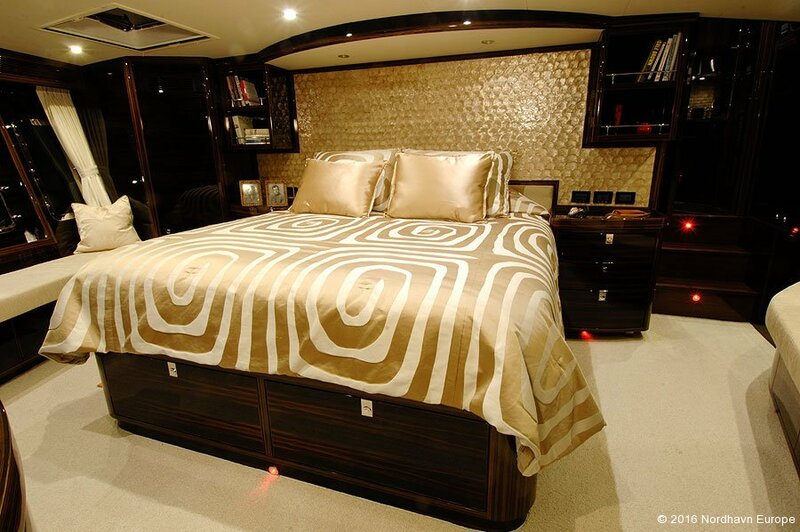 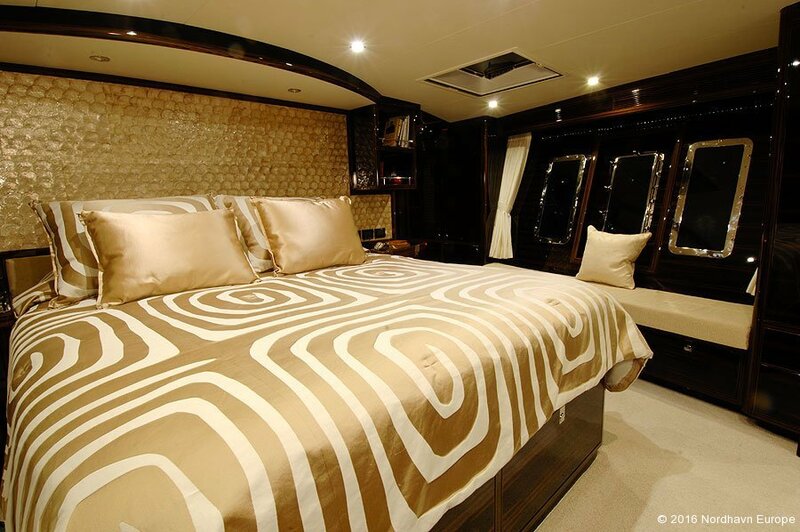 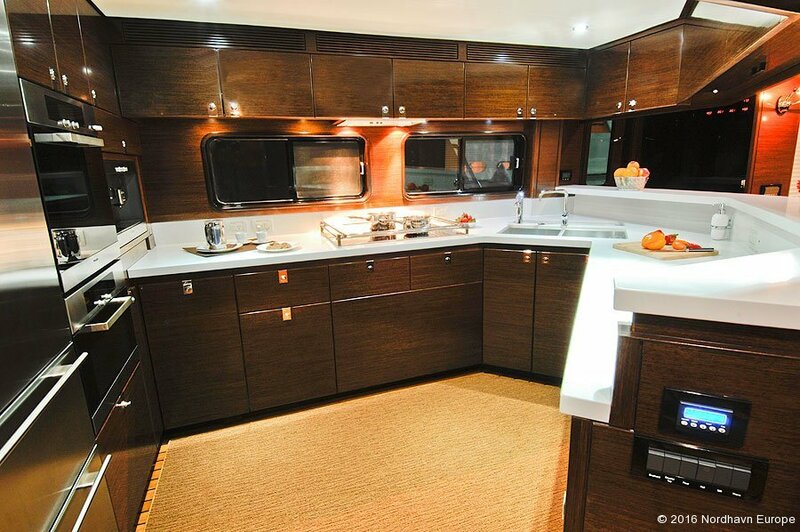 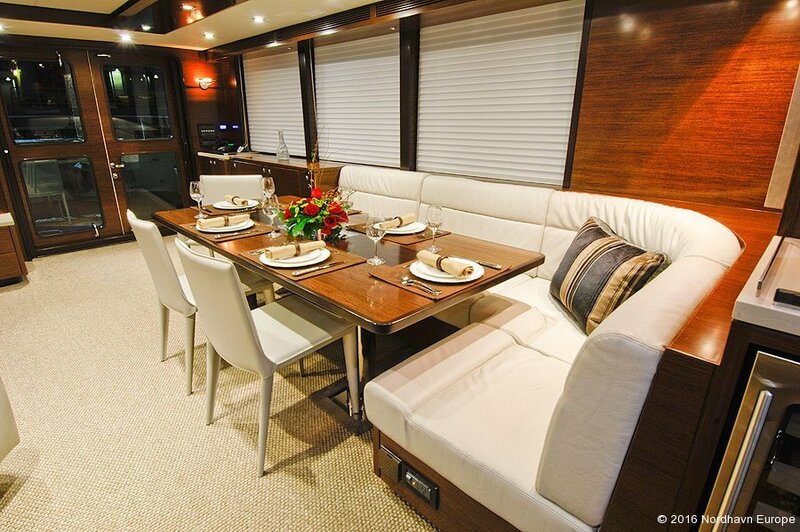 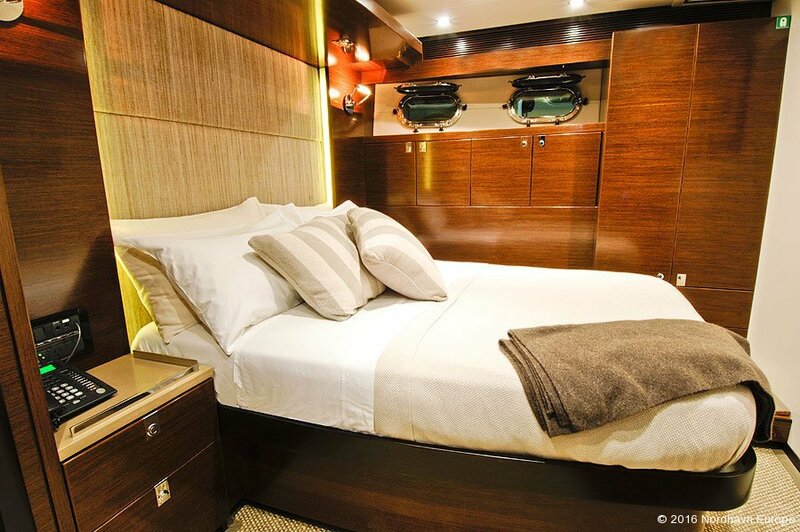 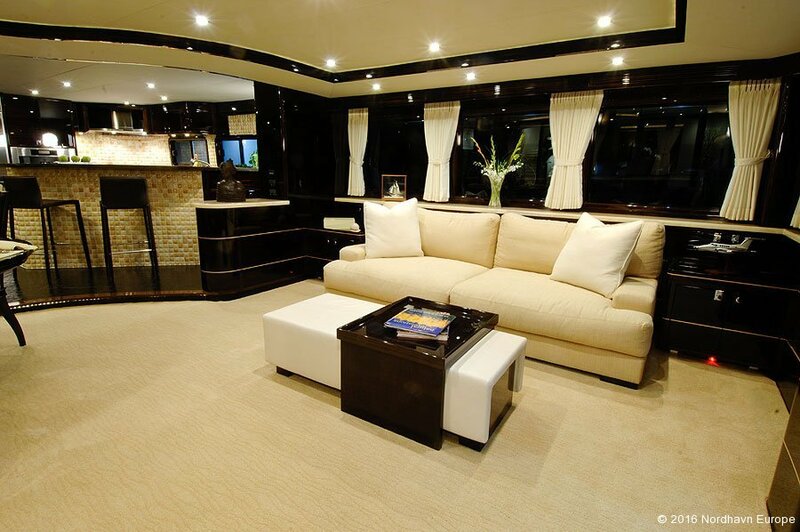 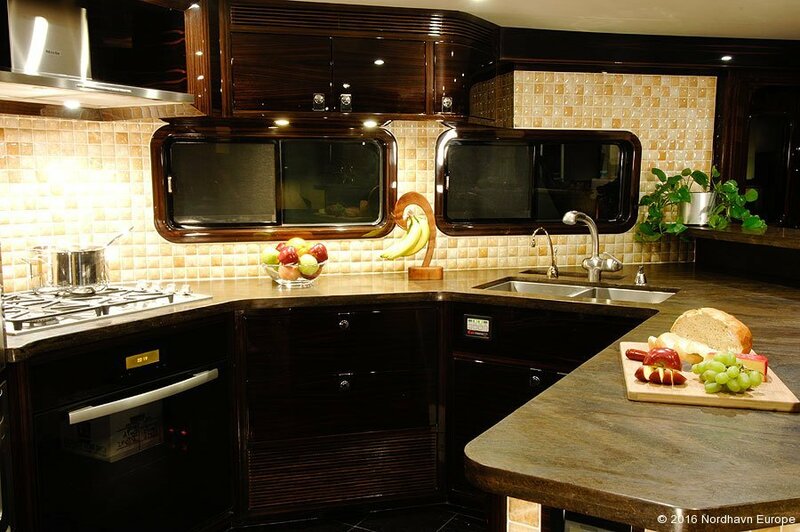 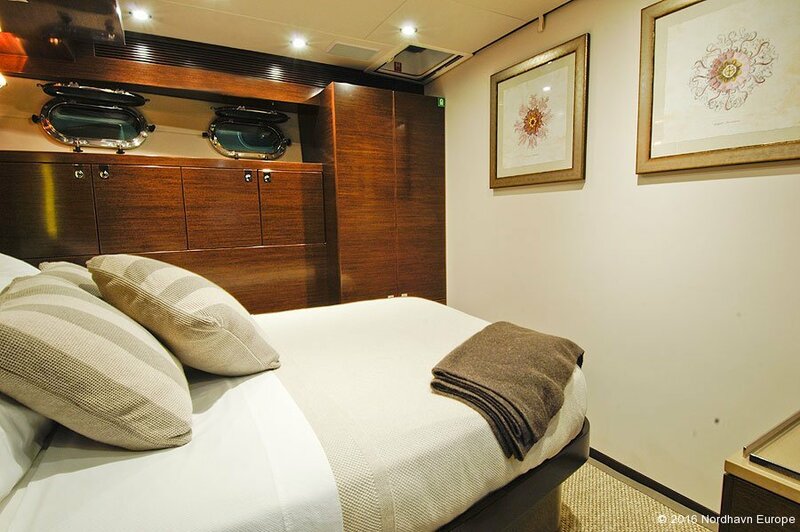 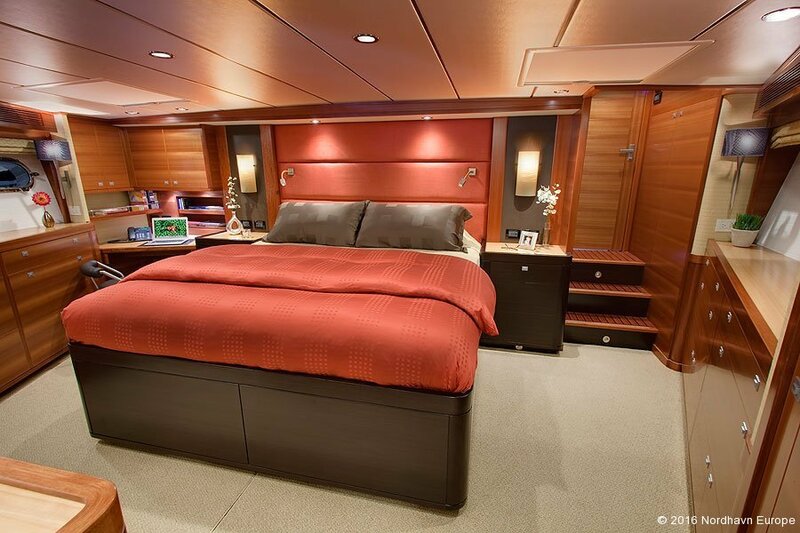 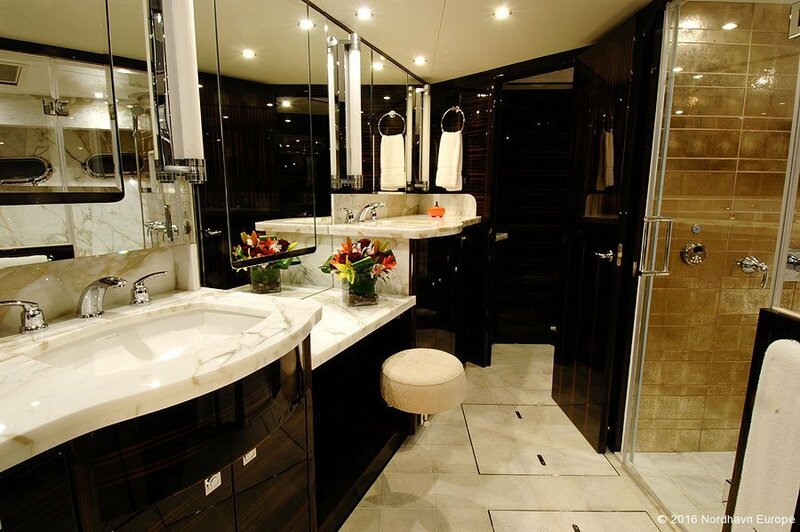 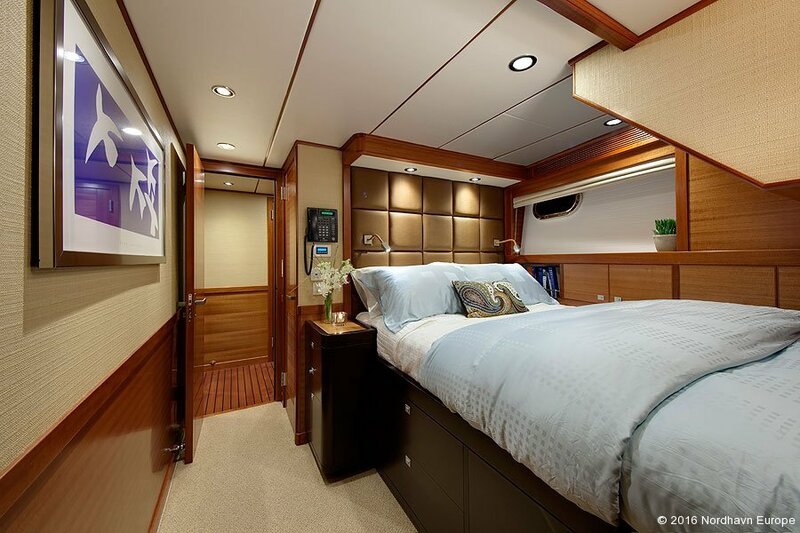 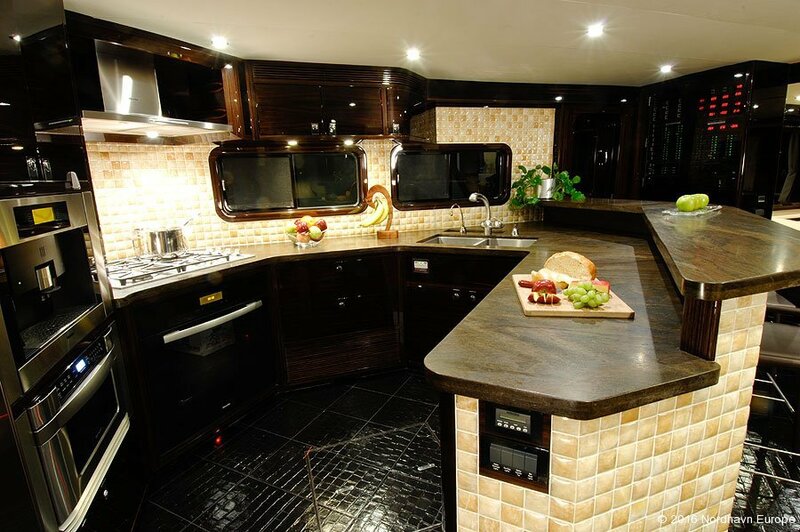 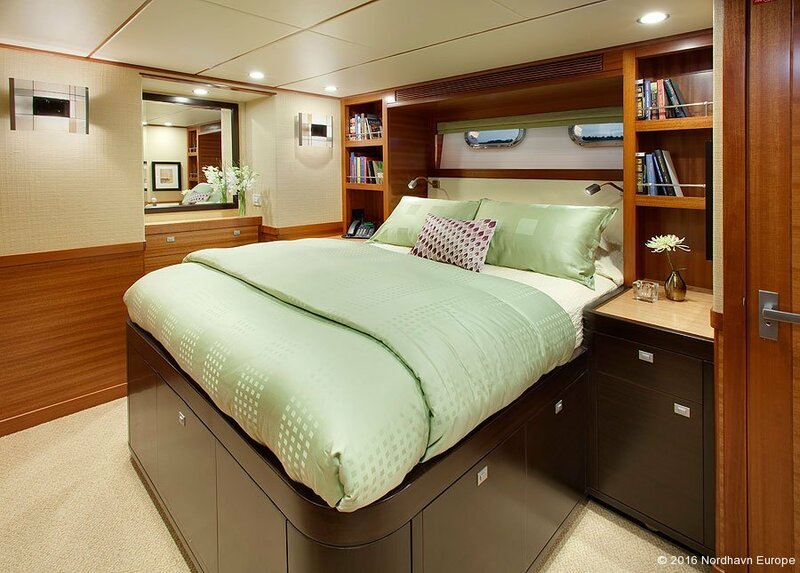 An interior decorator was commissioned to up the degree of style most megayachts are known for, including crown moldings, granite, leather, well-engineered lighting, and the finest appliances. 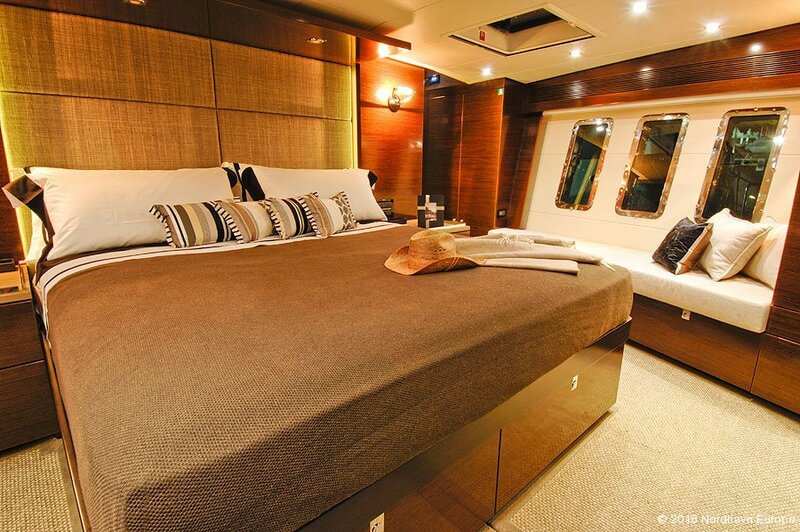 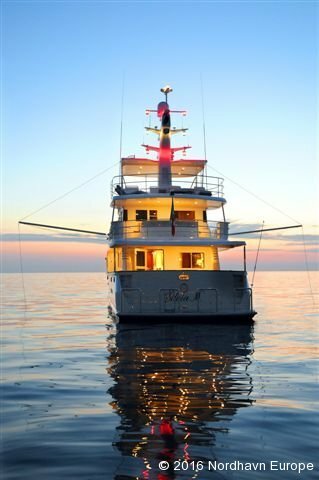 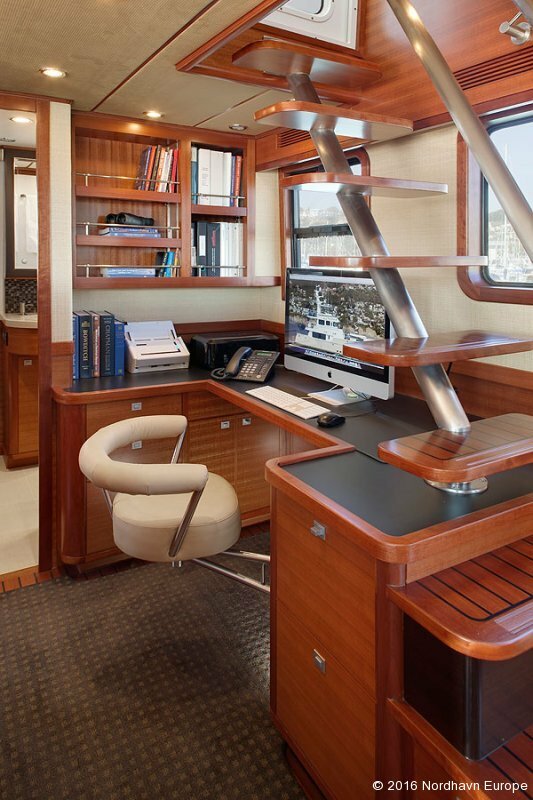 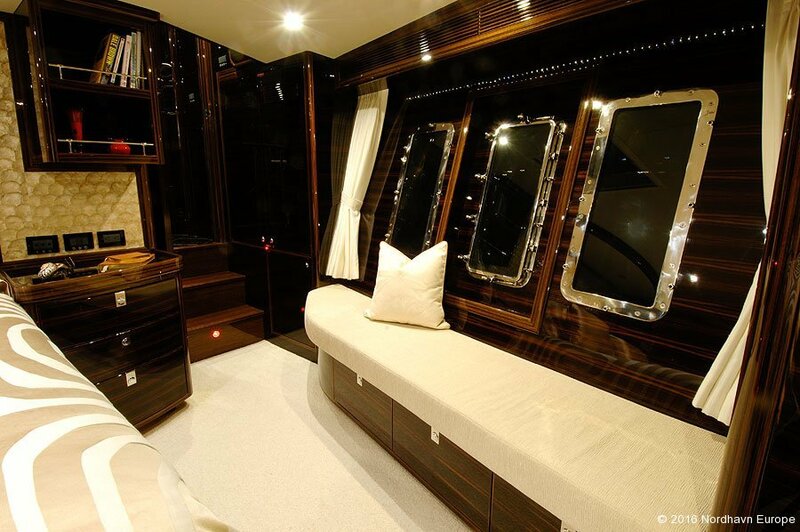 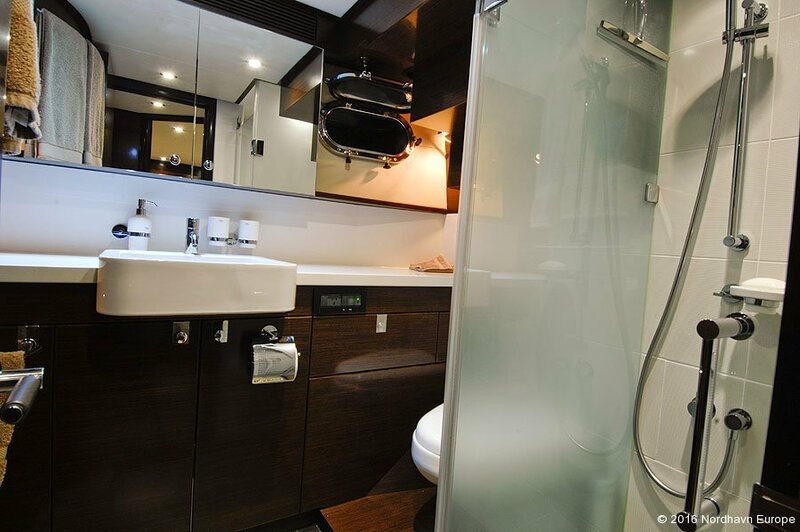 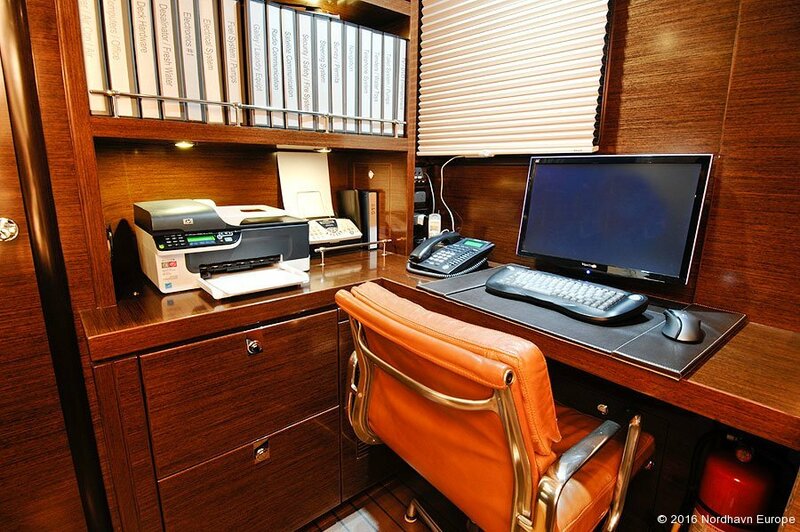 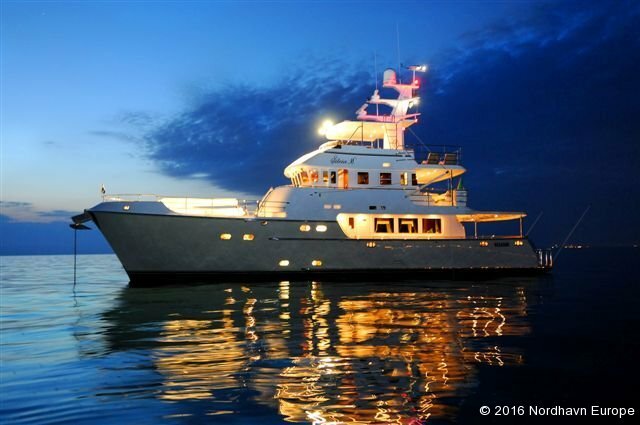 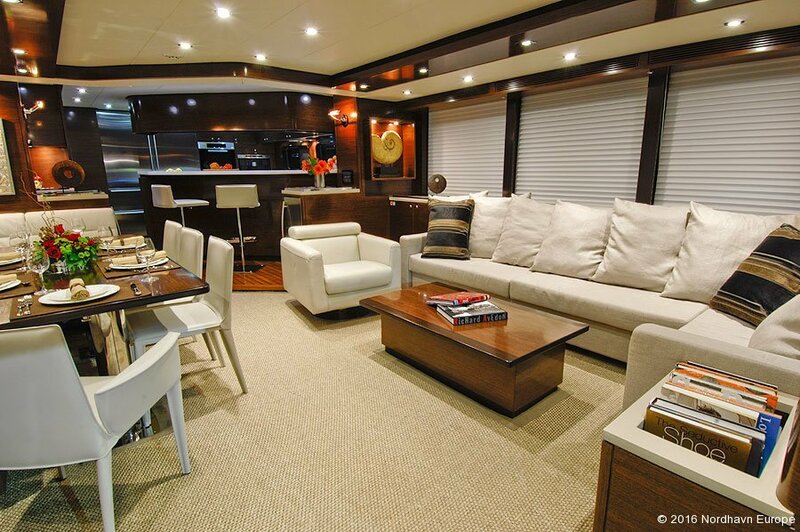 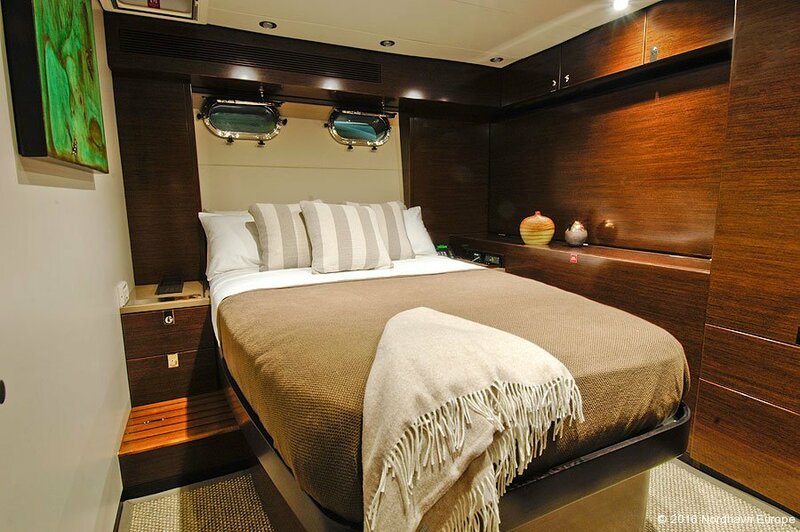 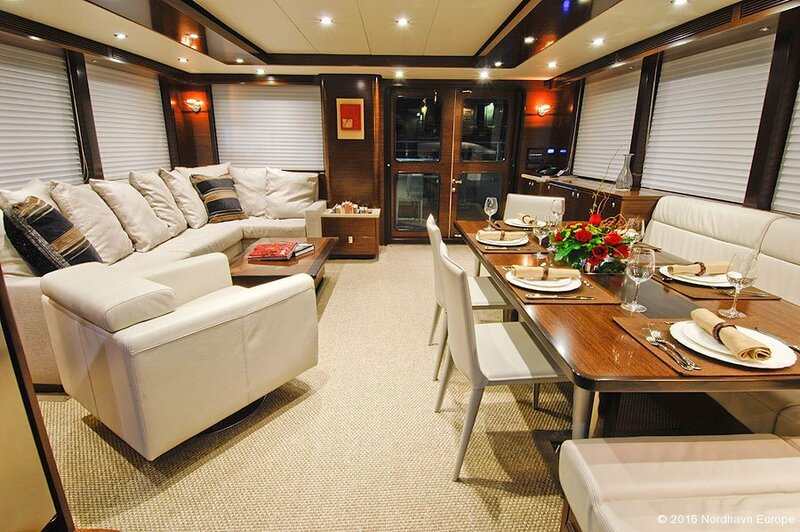 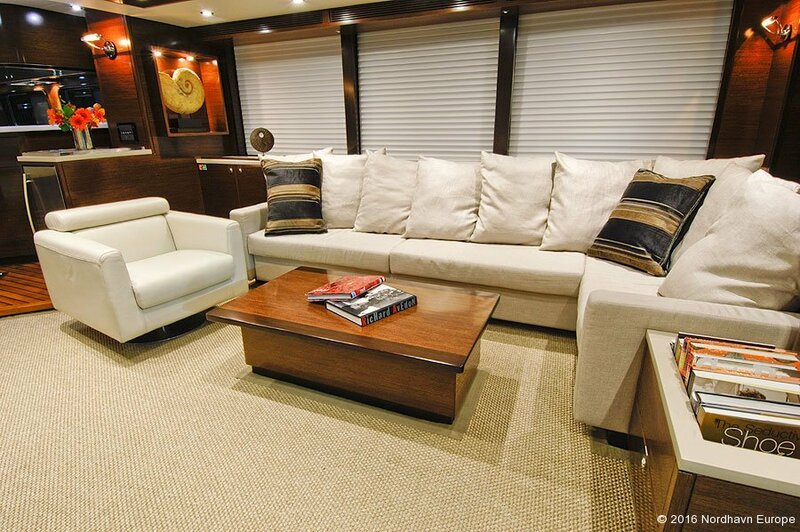 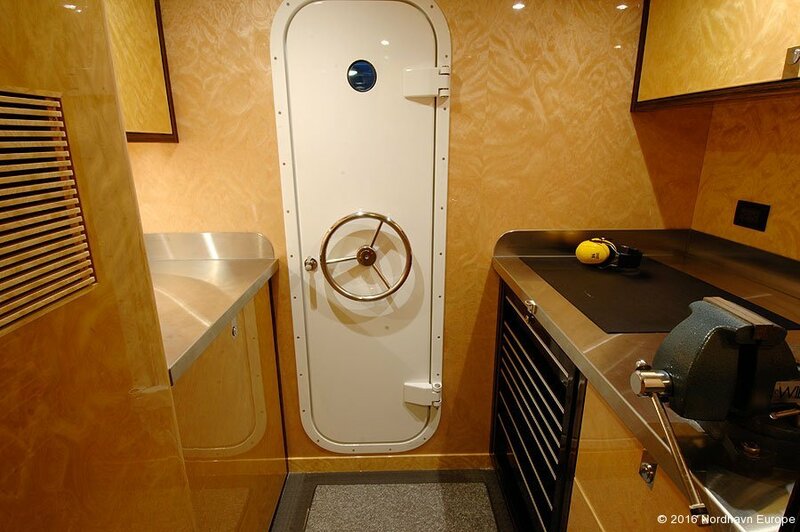 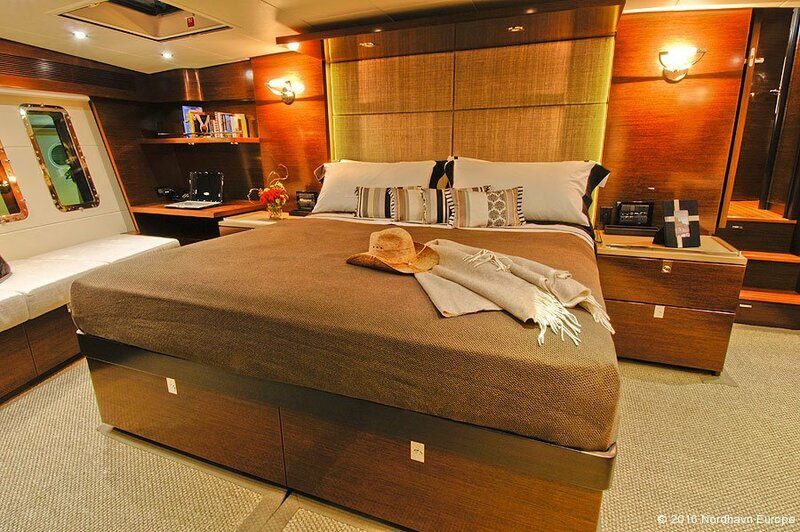 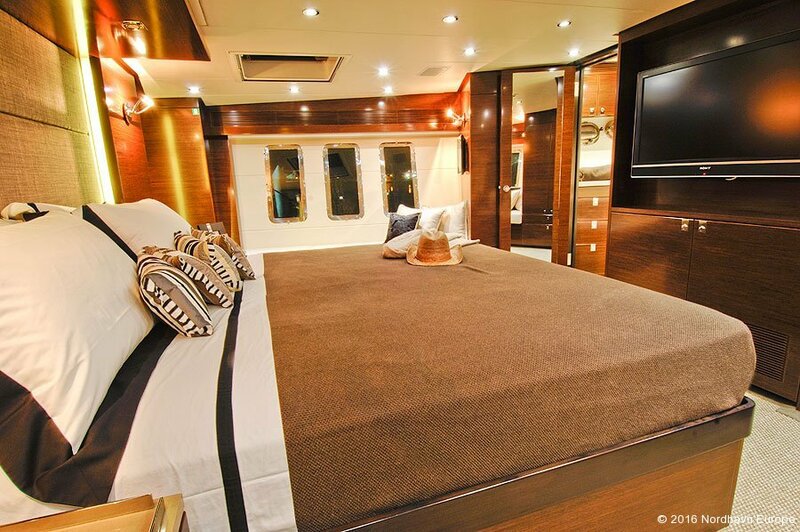 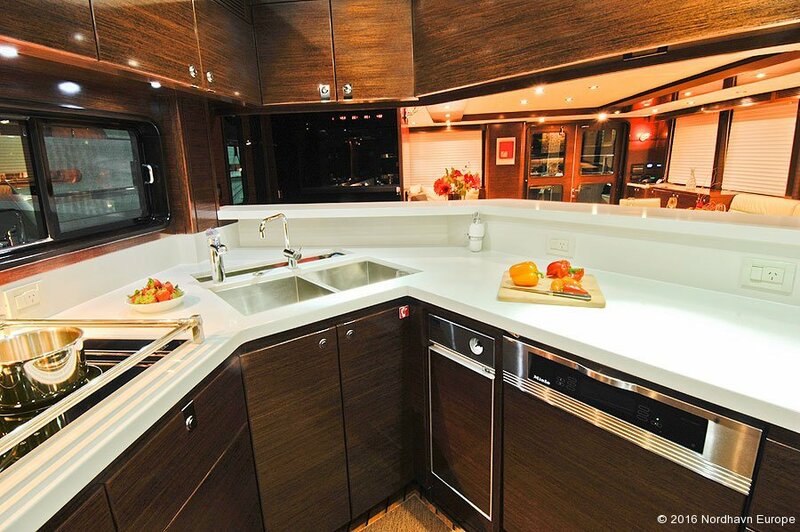 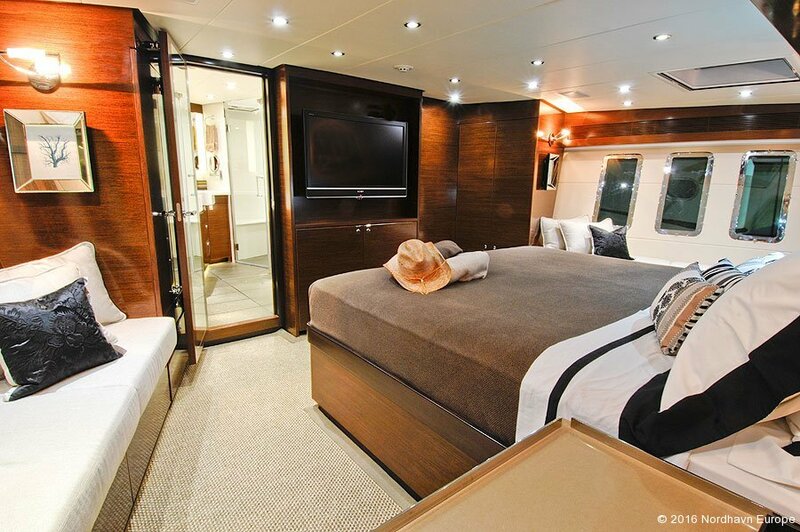 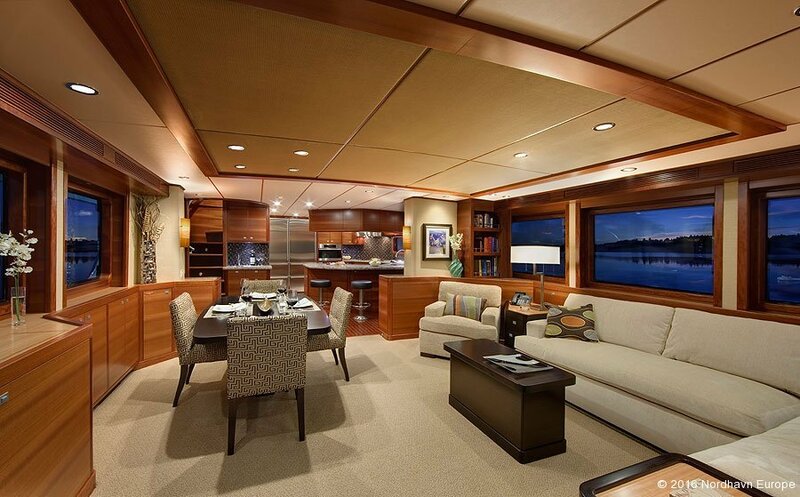 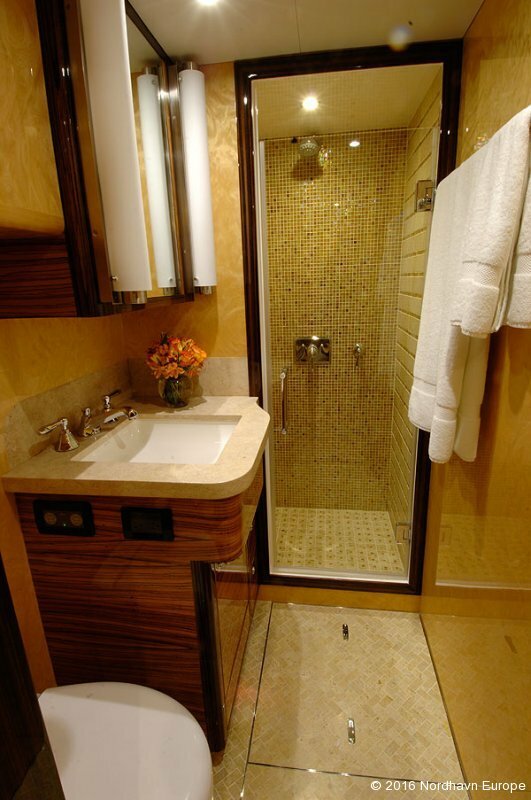 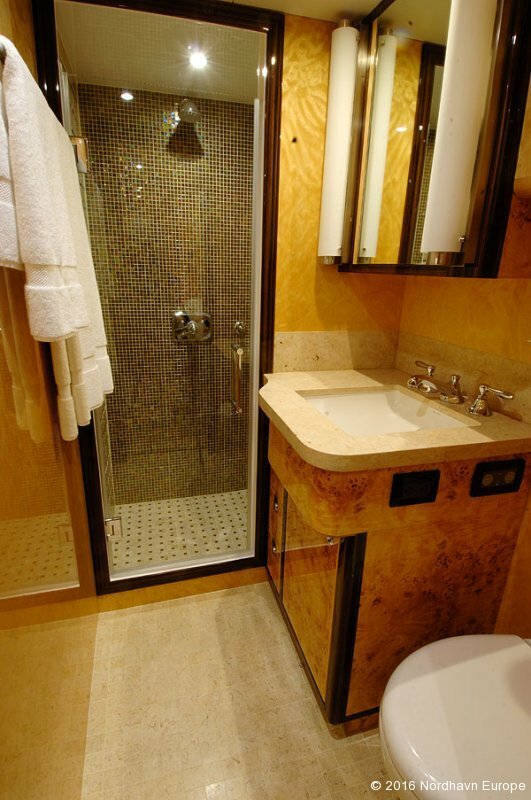 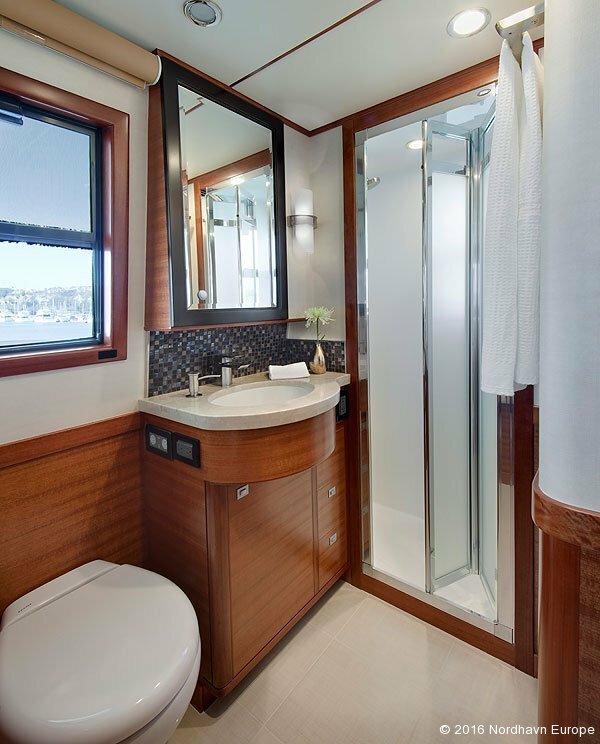 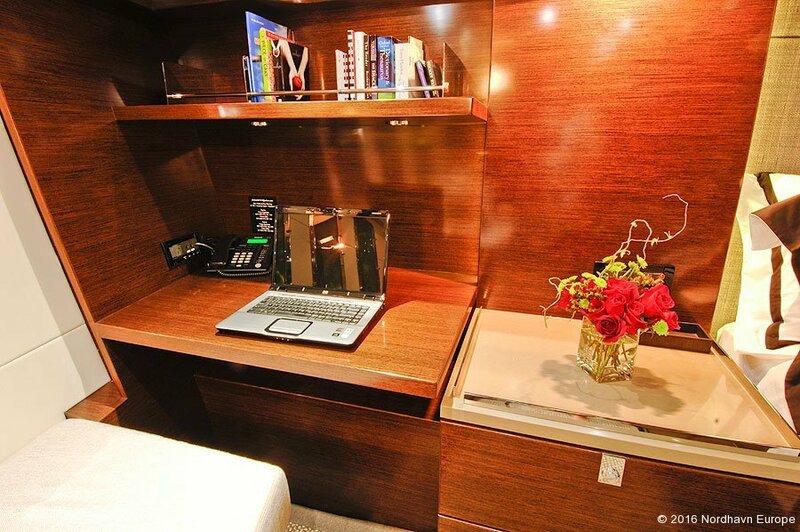 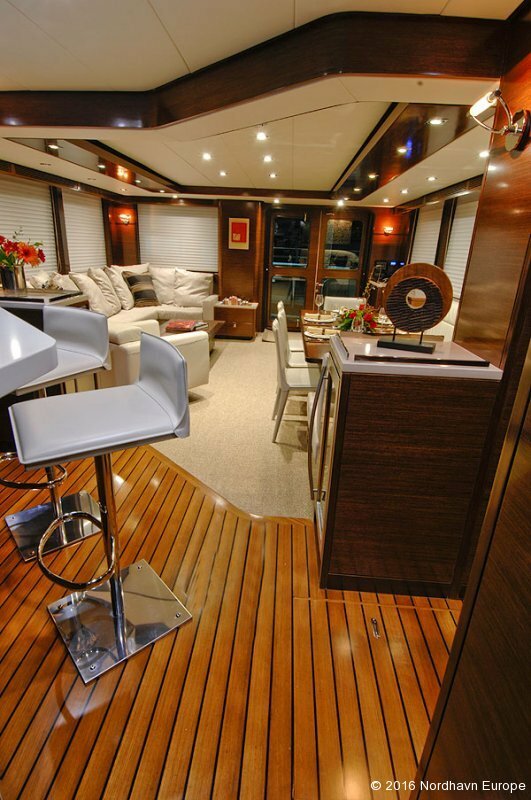 Though a little more glitzy, there’s no denying that a Nordhavn exists at the heart of this boat. 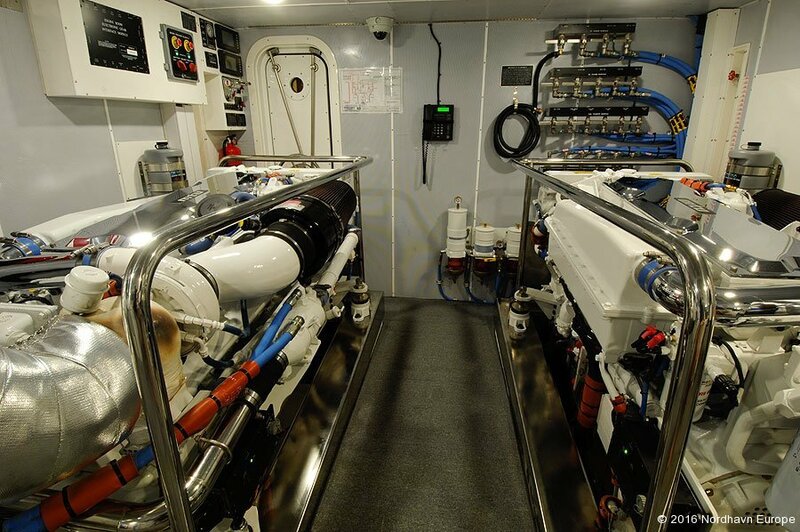 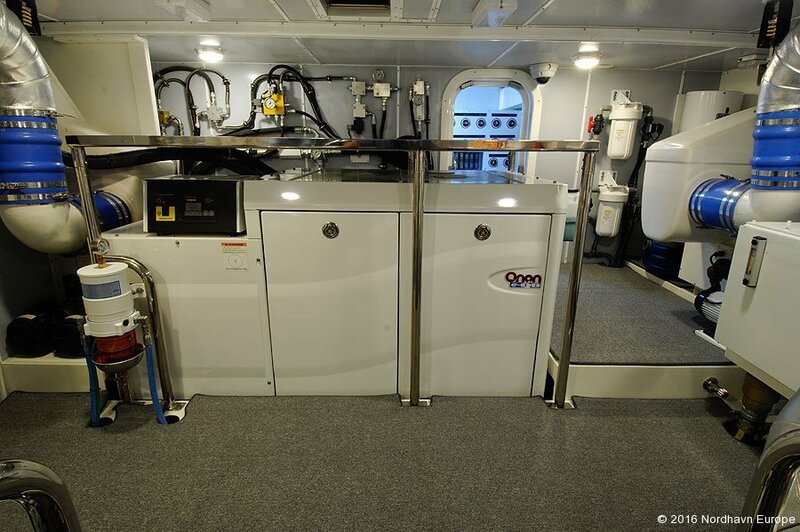 Numerous handrails, half-inch tempered glass windows, watertight doors and bulkheads and many other features essential for safe operation offshore. 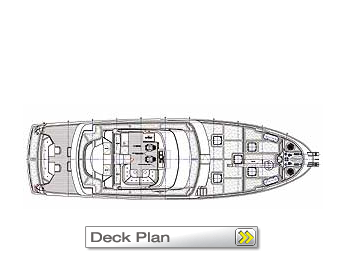 Like the 72, the fact that this boat is so complete, a regular options list does not exist. 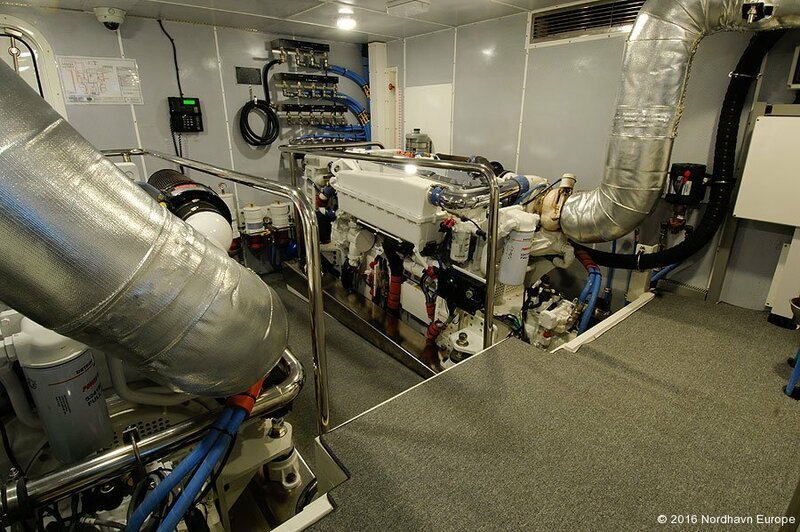 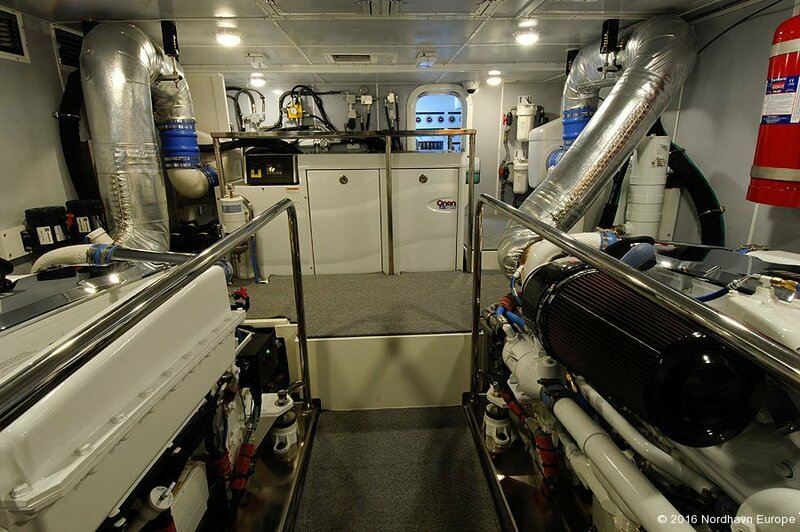 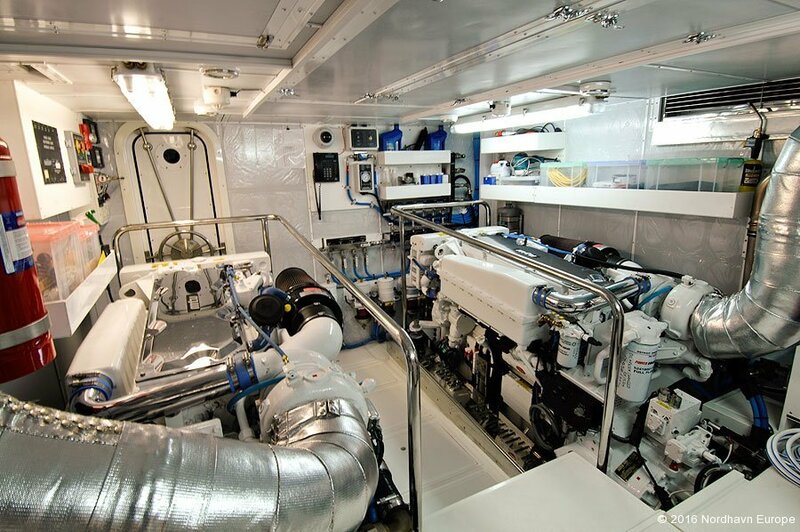 Standard on the 76 is chilled water air conditioning, TRAC stabilizers, bow and stern thrusters, Marquipt davit, wing engine, dry exhaust, windlass and ground tackle, and a lot more. 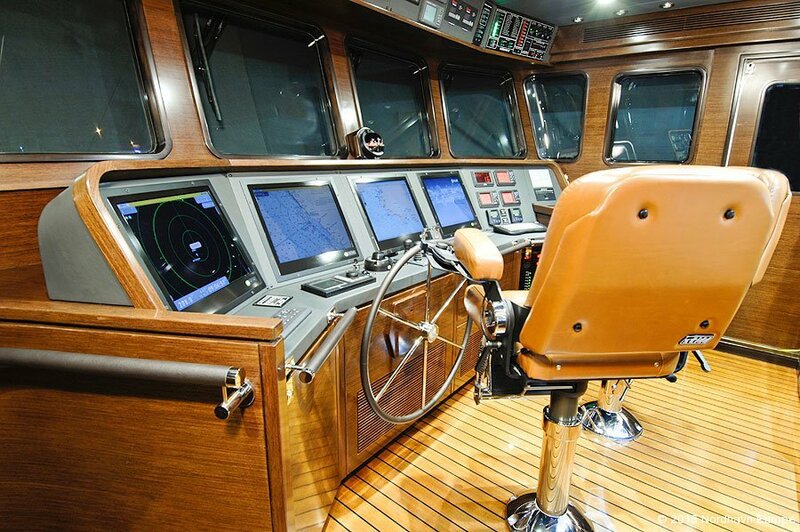 Simply add your electronics package, tenders on deck, personal affects you’re ready to go. 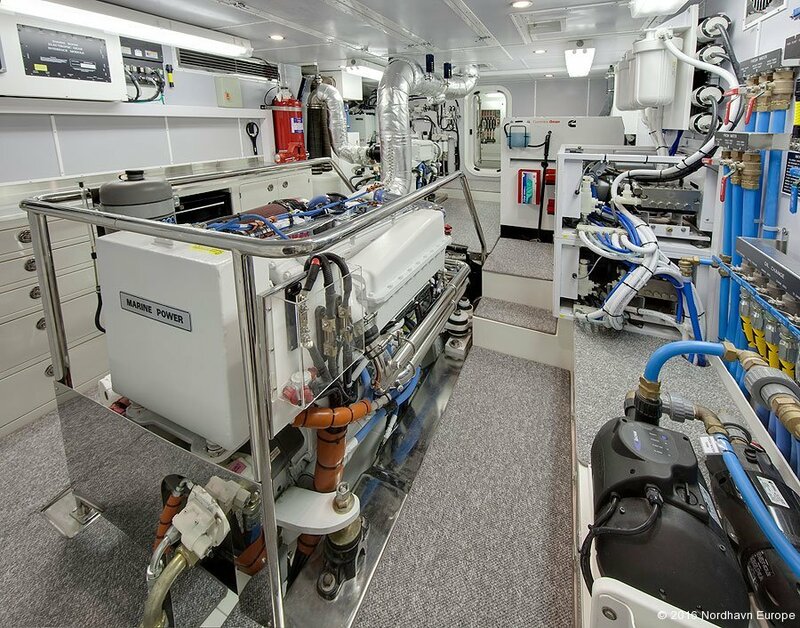 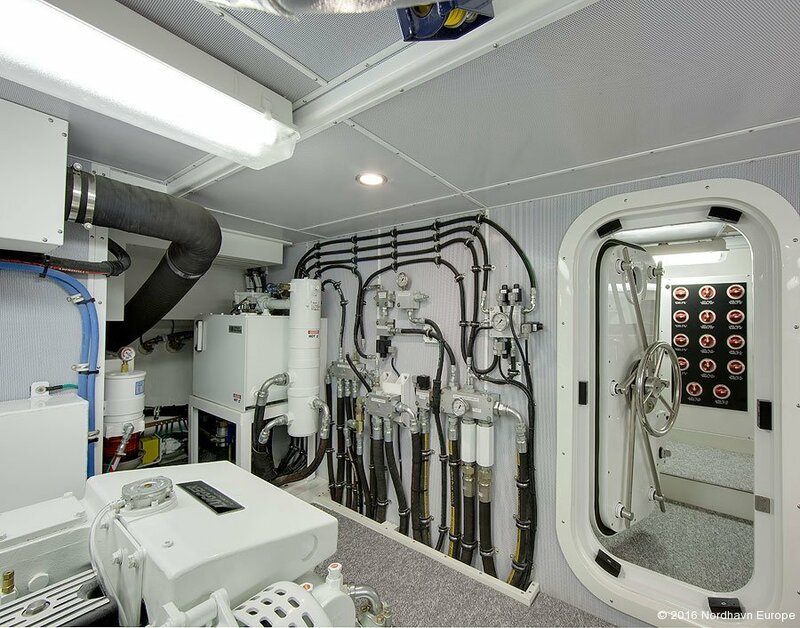 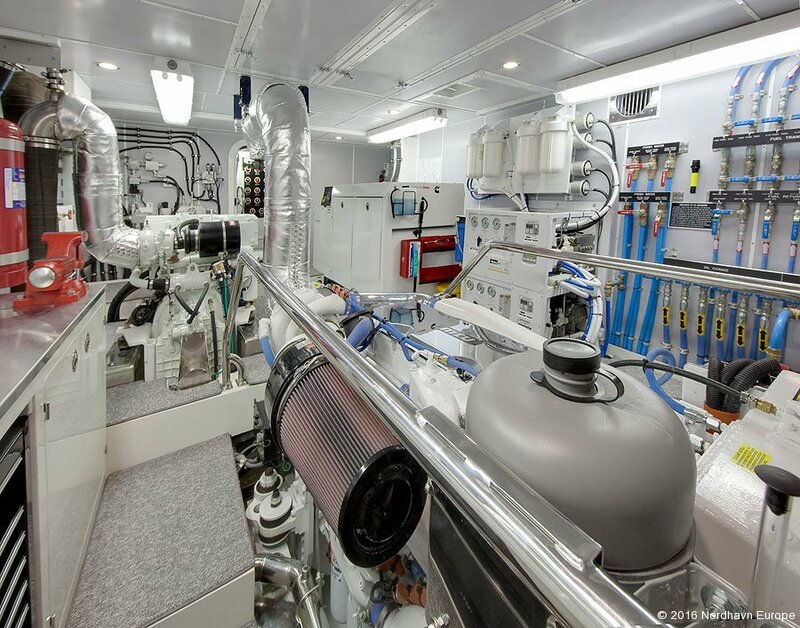 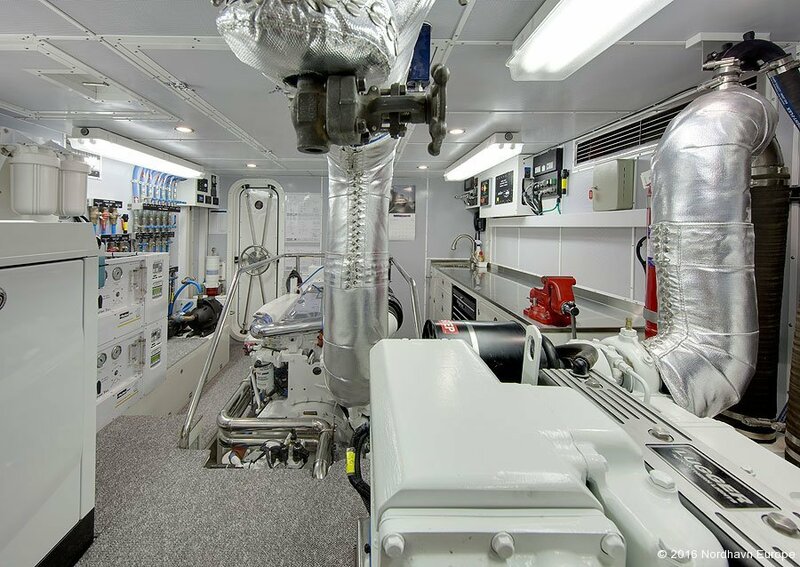 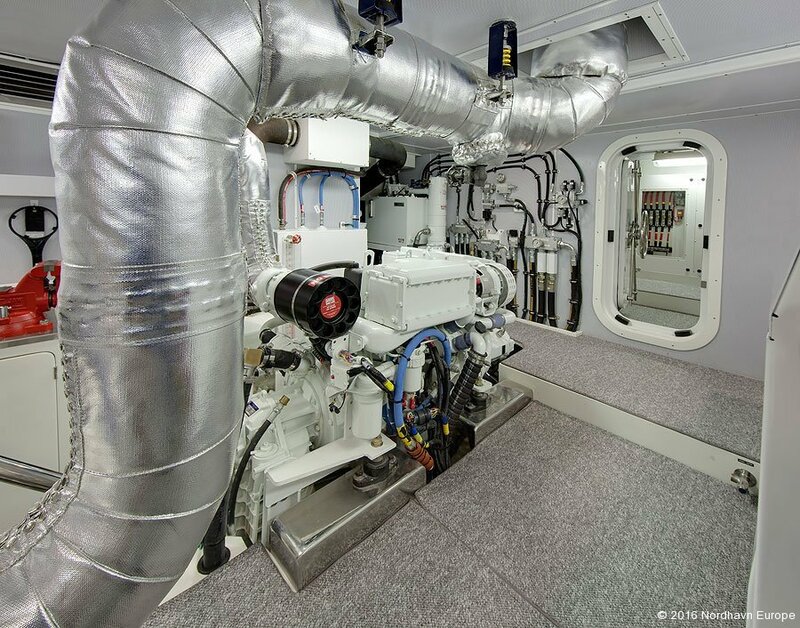 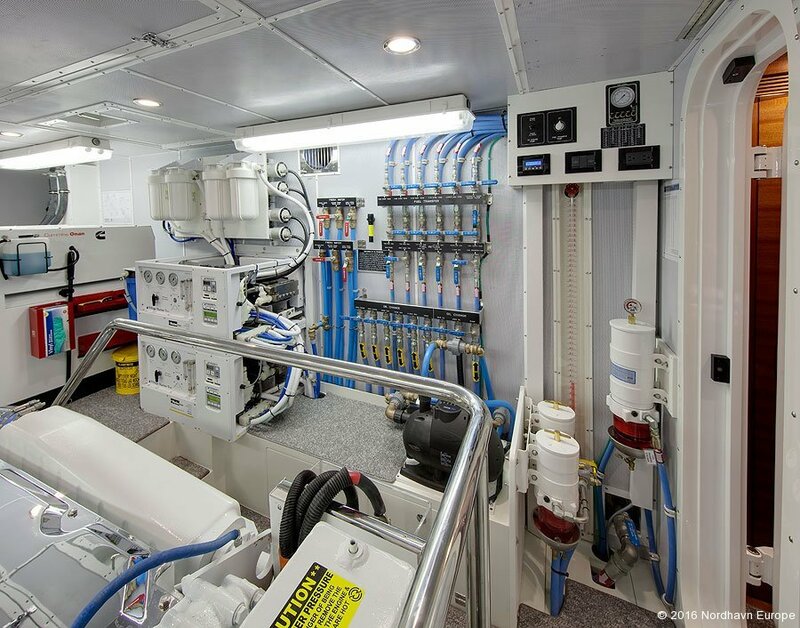 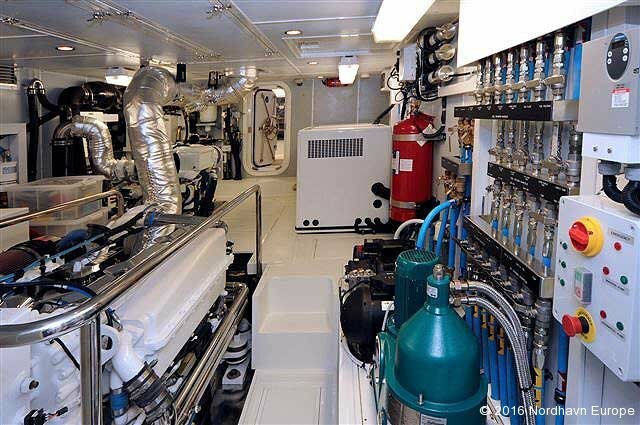 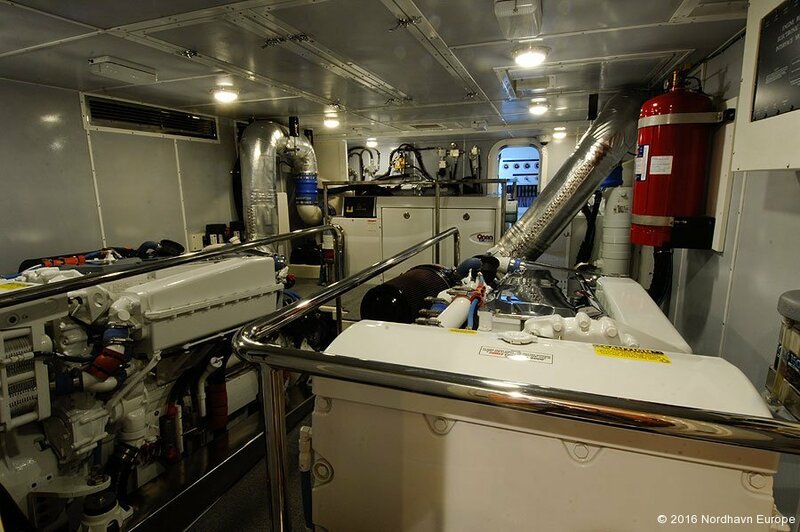 The highly developed standard AC and DC electrical systems on the N76 achieve a new level of sophistication for Nordhavn and allow for semi-automatic operation of this feature-packed vessel by a small crew or even one couple. 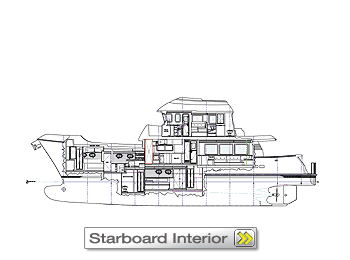 The standard propulsion configuration of the N76 is classic Nordhavn. 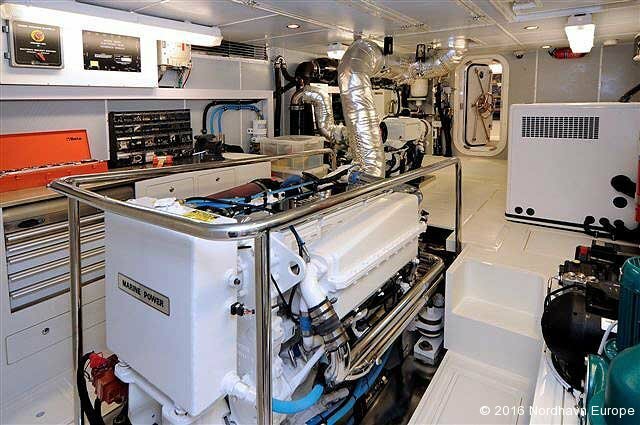 The single main engine is the highly respected John Deere 6135AFM in the 500 hp configuration and with its 20,000-hour life expectancy, should outlast most of us. 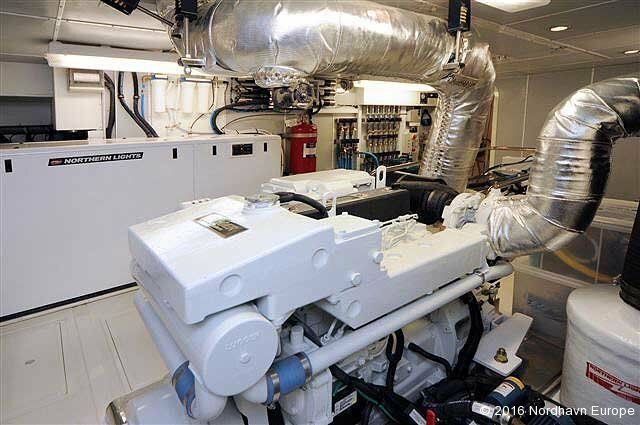 Dry exhaust and keel cooling are standard as is the Lugger wing engine. 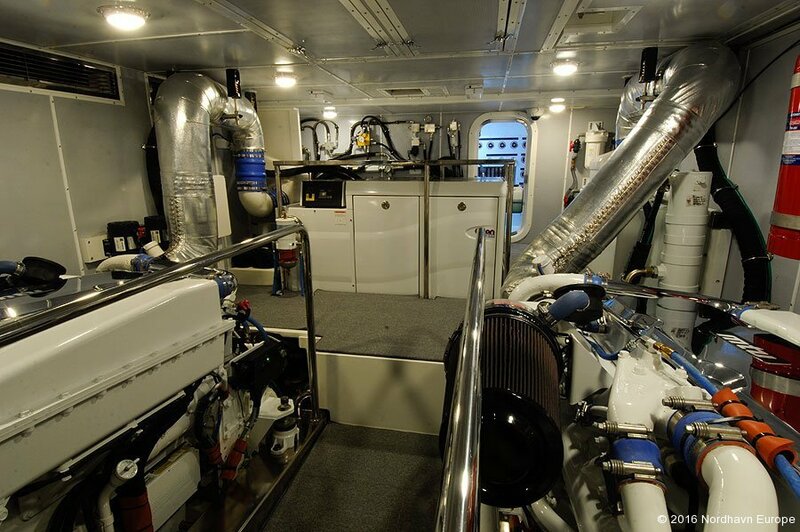 The N76 is also available in a twin-engine configuration. 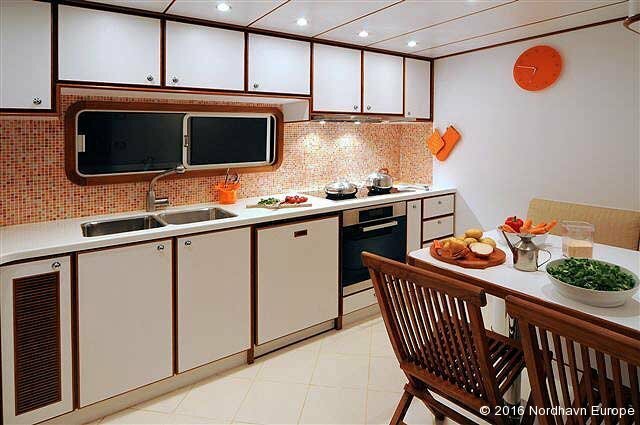 Through clever design and forethought during the tooling phase of the project, keel molds for the twin engine layout were built and can be inserted into the main hull mold prior to lamination. 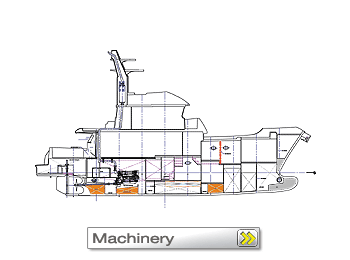 This feature provides twin keels and protection for the shafts and propellers of the twin screw layout. 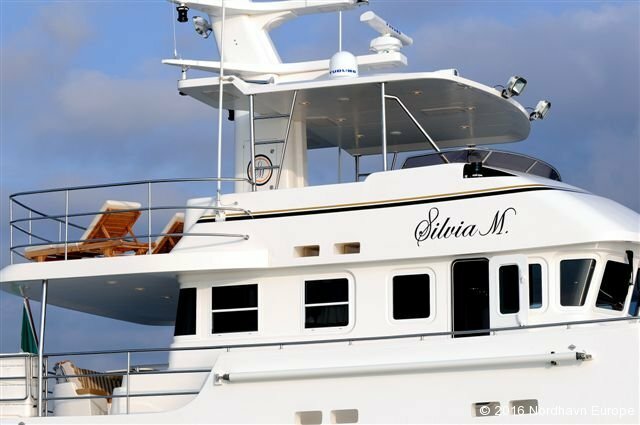 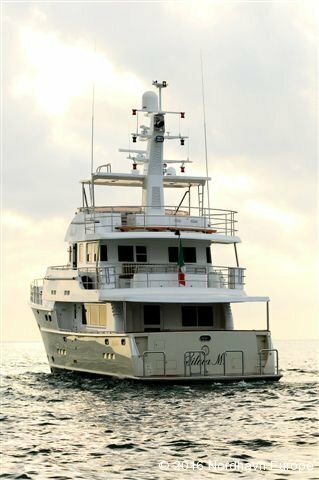 Another choice that the buyer of an N76 is given is whether or not to have a bulbous bow or conventional bow. 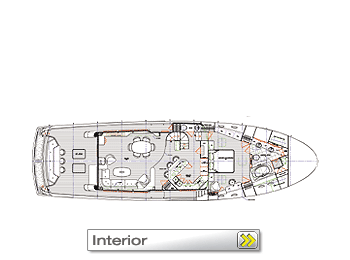 The N76 hull mold has two different bow configurations (conventional and bulbous) which are interchangeable and set up prior to hull lamination. 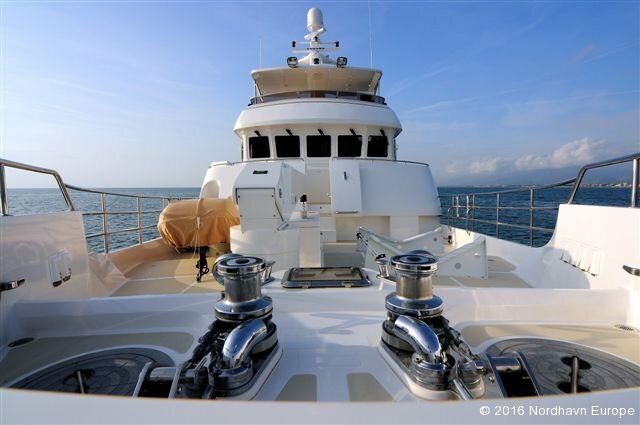 The bulbous bow provides benefits but also has an unpleasant side to it and thus has become somewhat controversial in recent years. 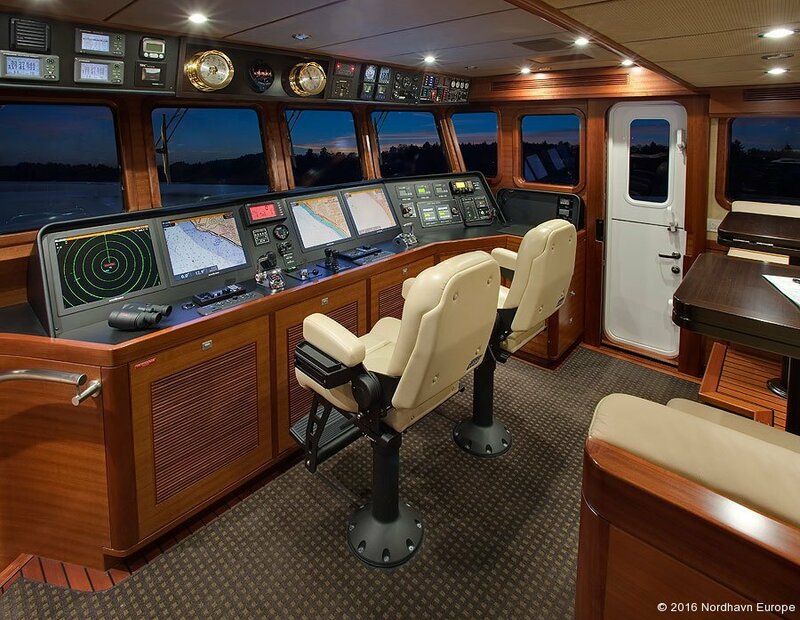 We will discuss with you your intended use of your Nordhavn 76 and help you decide which bow configuration is right for you. 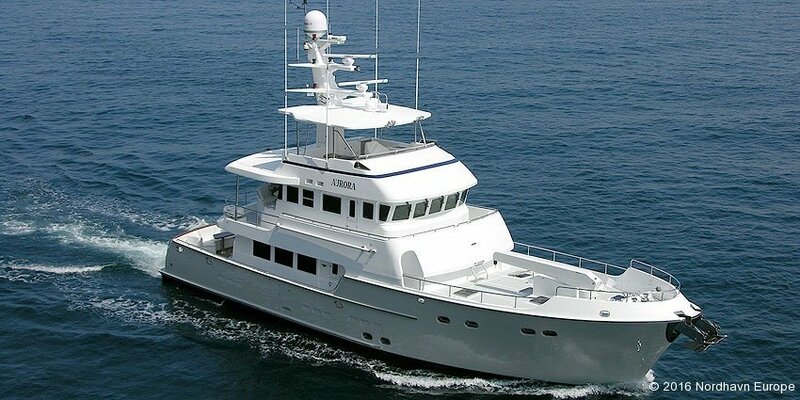 Unlike other semi-custom yachts out there, buying a Nordhavn 76 need not be stressful or risky. 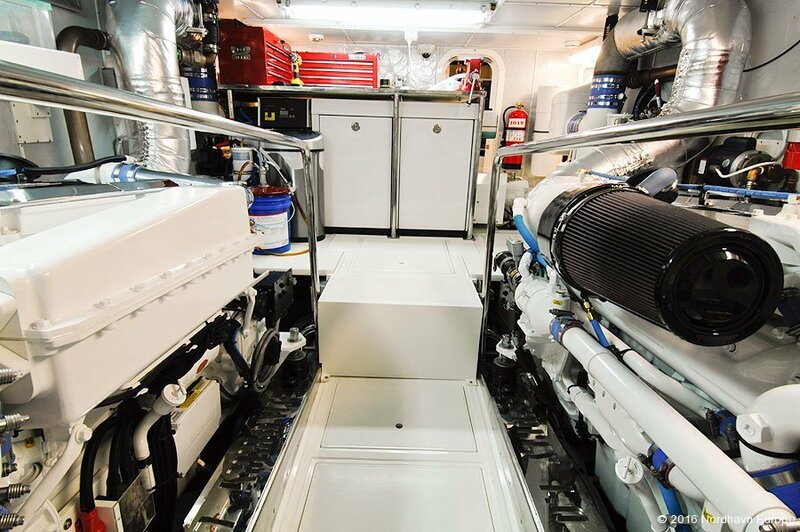 The N76 is fundamentally a fiberglass production boat built in molds on an established production schedule by a highly competent team, which has been together for 30 years. 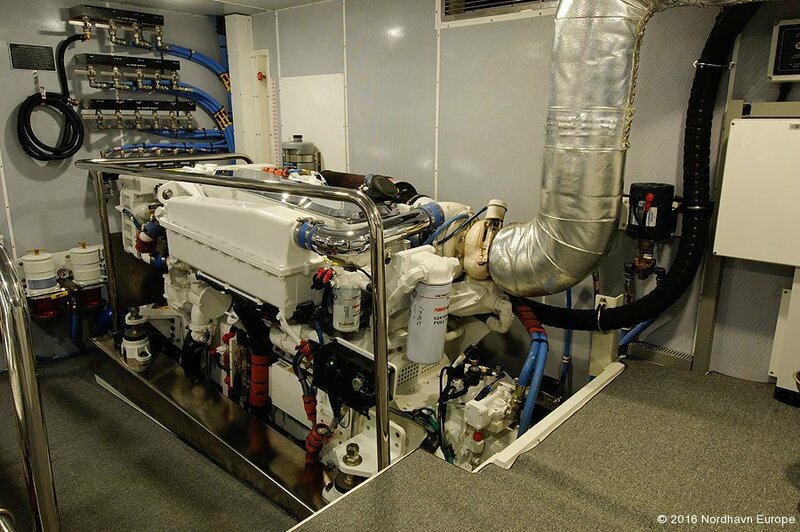 Systems, engineering and performance are solid, well-developed and proven. 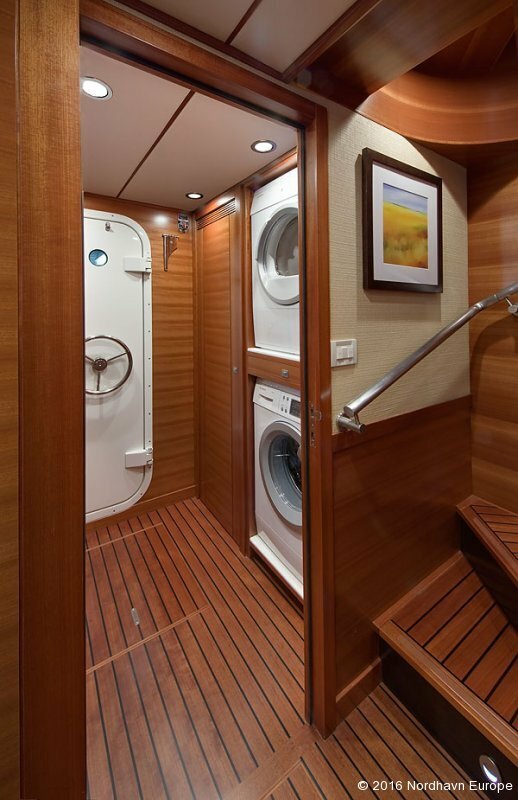 You can inspect existing N76s to witness how special the fit and finish of this boat really is. 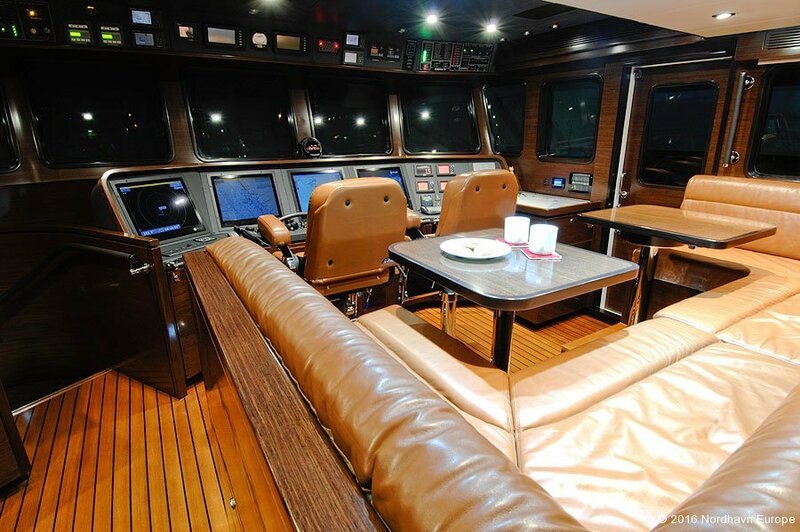 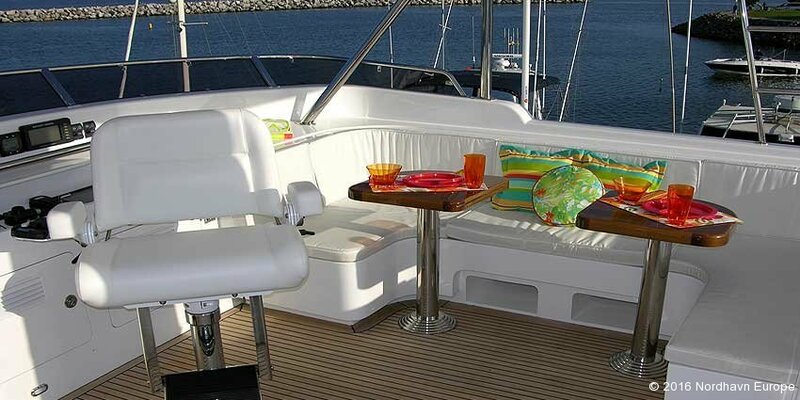 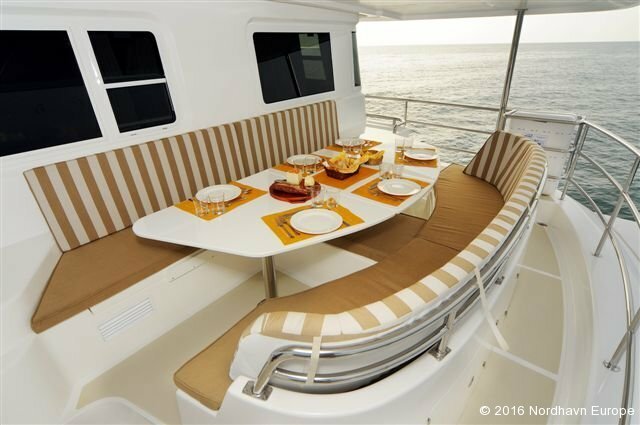 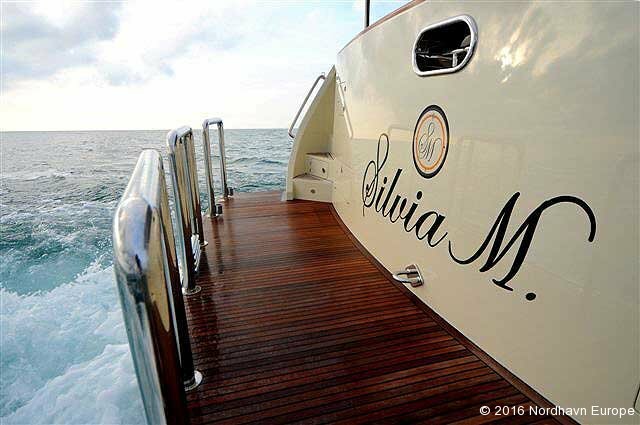 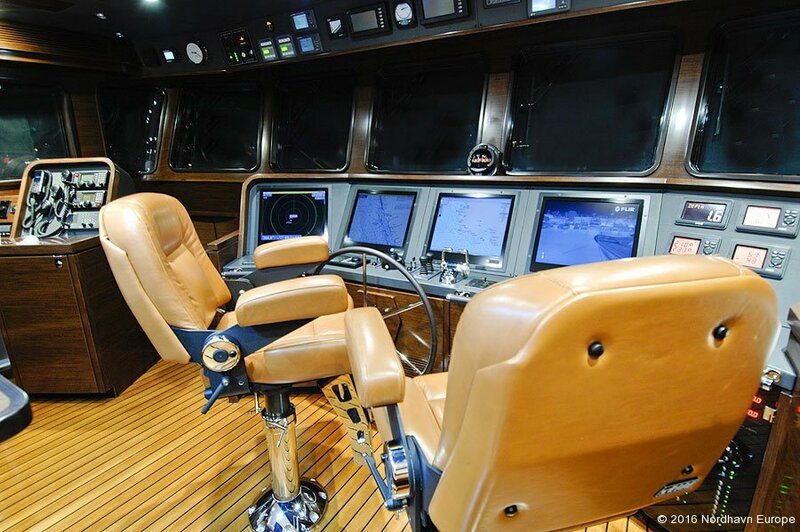 Climb on board and get a feel for how comfortable it is to operate, and on a sea trial, experience the smoothness, low noise levels, sea kindliness and comfort. 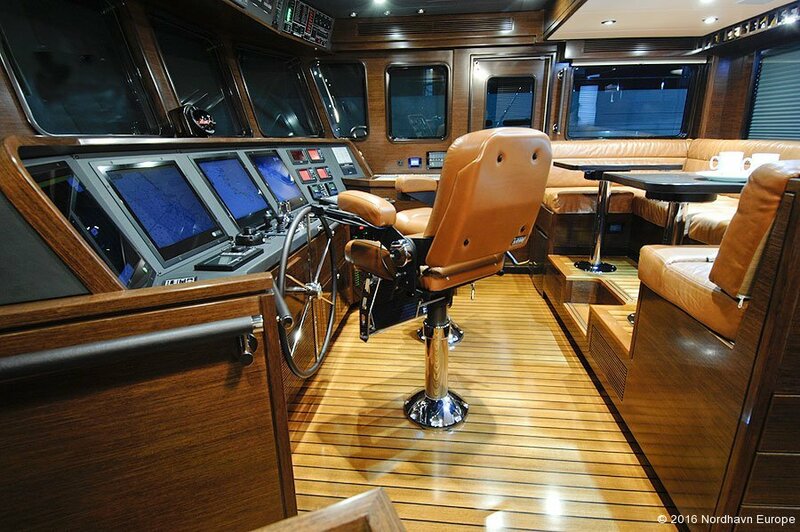 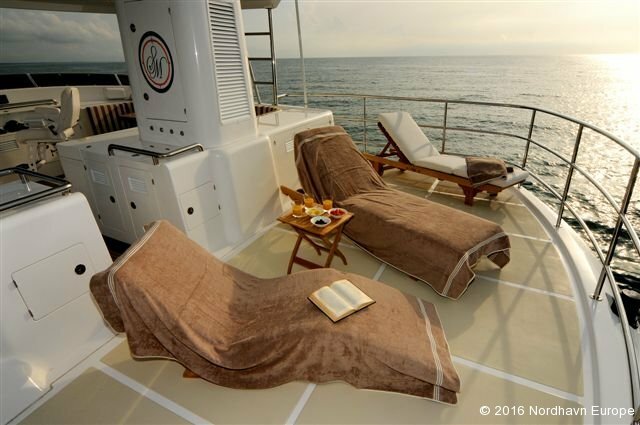 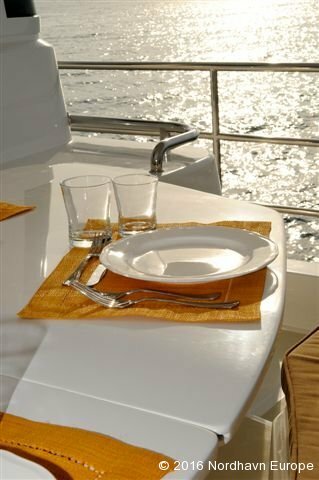 Within the “production boat” safety net, you can still customize your Nordhavn with décor, equipment and features to achieve your desires. 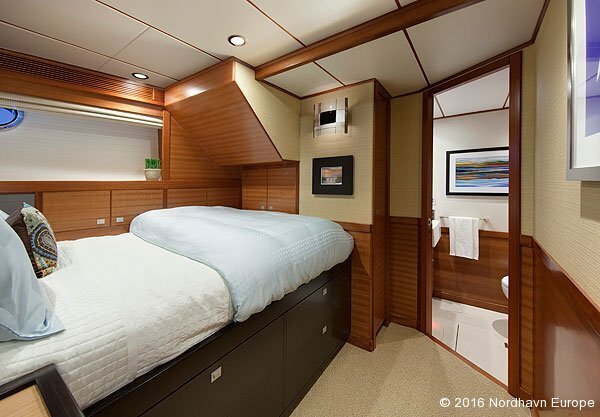 No two N76s will be alike, but all will share the same quality, seaworthiness, factory support and excellent resale value. 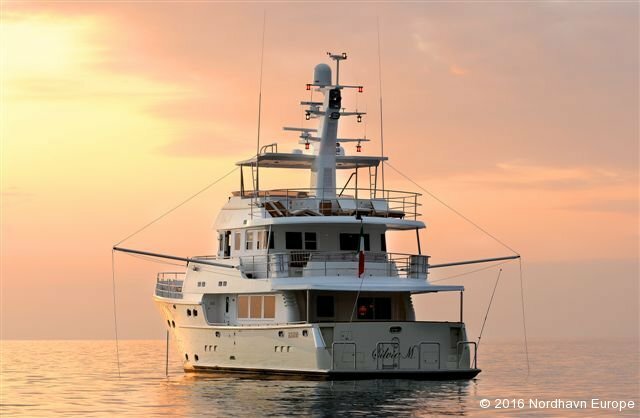 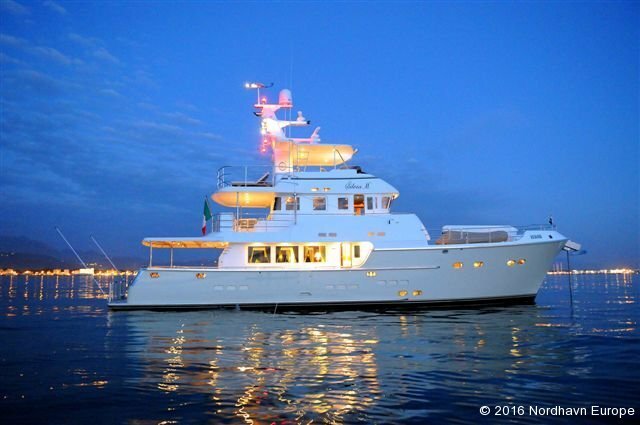 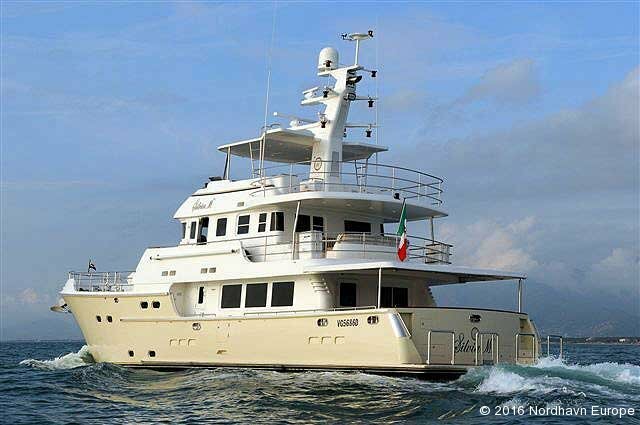 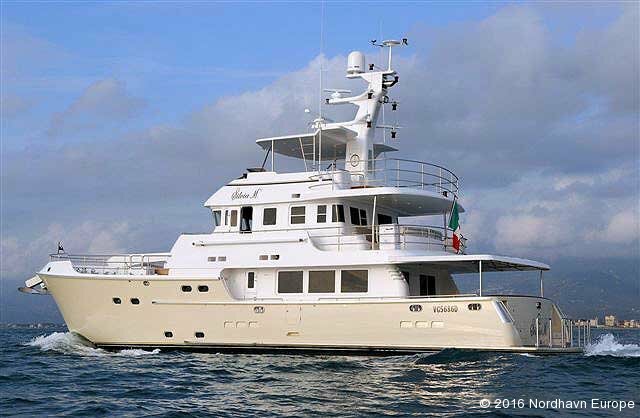 Like the Nordhavn 68, the Nordhavn 76 is available in both aft and forward pilothouse configurations. 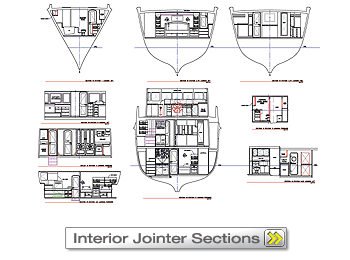 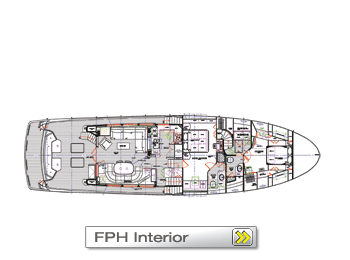 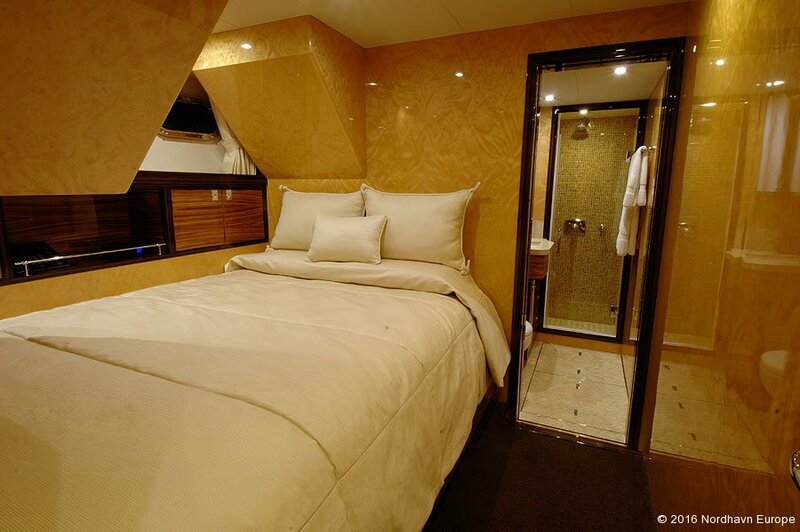 But while a number of differences exist between the 68’s two layouts, there are virtually no differences in performance or specifications between the N76 APH and FPH models – the only exception to this being the slight bump in interior volume courtesy of the increased height presented by a raised pilothouse. 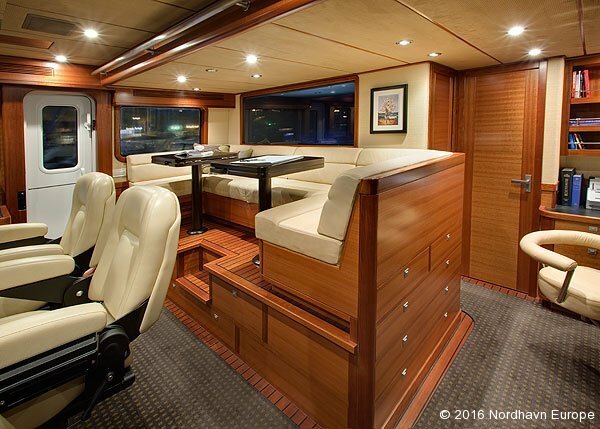 When considering a Nordhavn 76, the choice to go either forward or aft pilothouse is purely in the eye of the beholder and depends on whether you like a salty style or prefer clean, sleek lines. 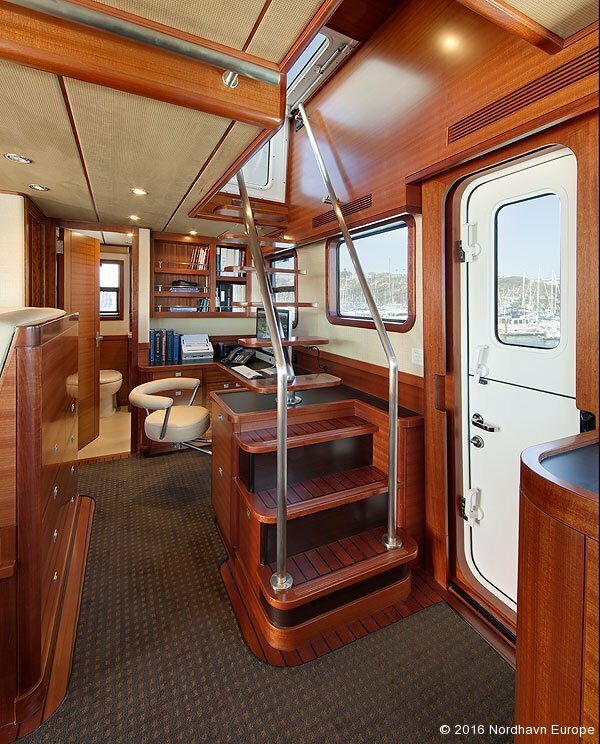 The model’s track record shows most buyers have a penchant for the traditional trawler look of the APH, with only a handful of FPH models having been built. 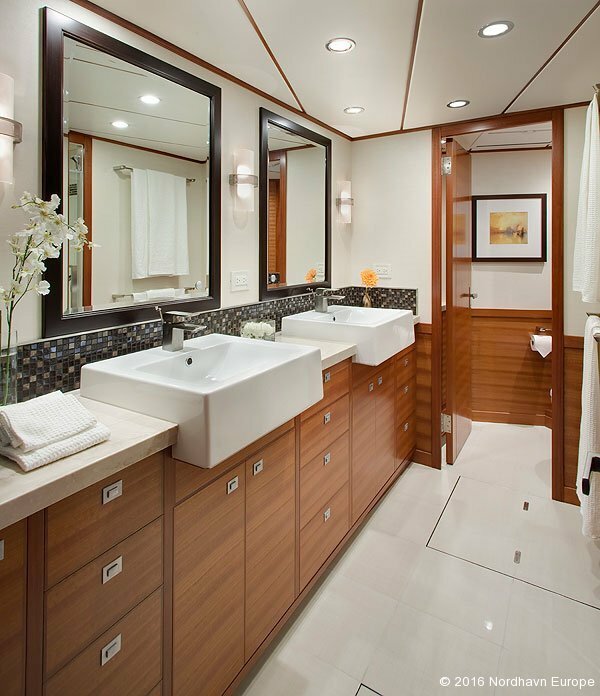 Either way, you’ll be getting one of the most luxurious, seaworthy, and sought-after yachts the world over. 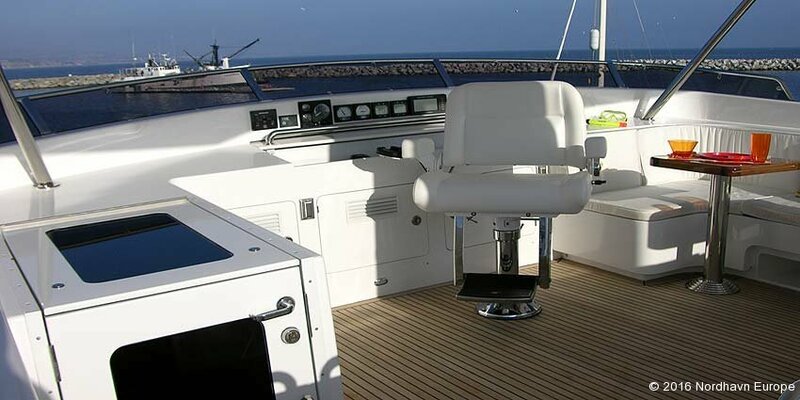 TRAC #370 digital stabilizer system with 16 sq. 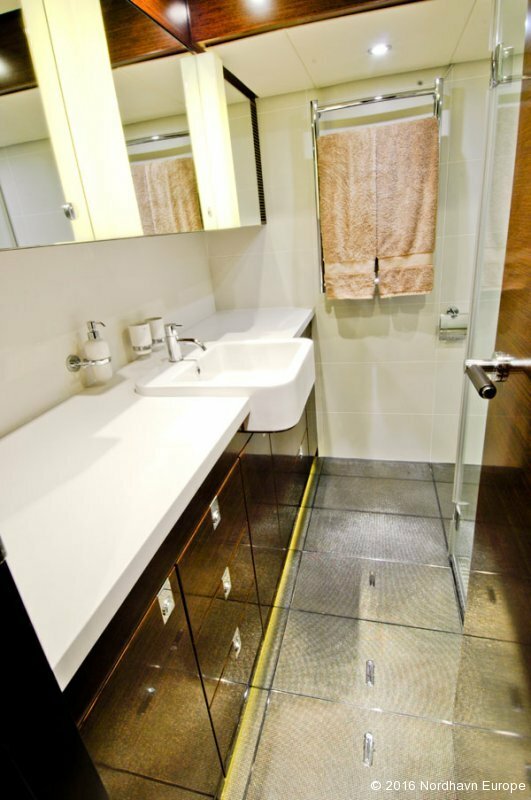 ft. (3.6 sq. 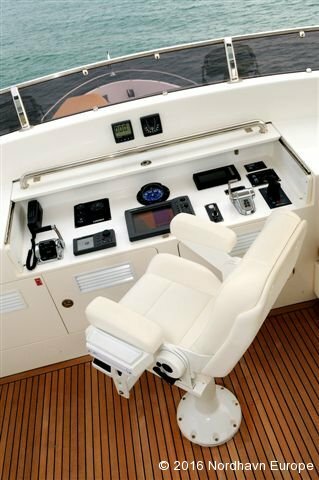 m.) fins and dual station control. 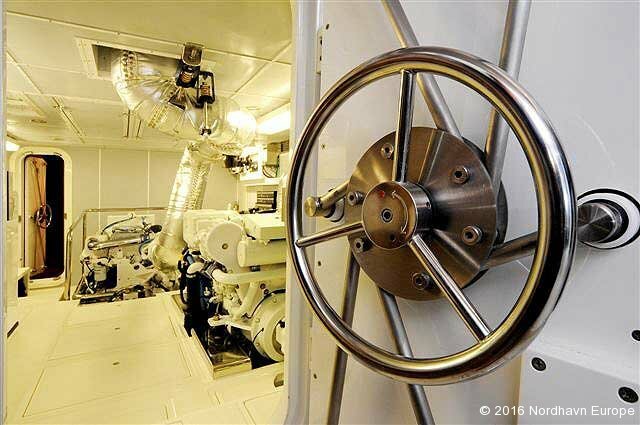 Stainless steel kelp cutters forward of fins tied to bonding system. 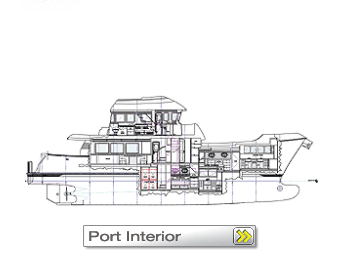 System is without winglet assembly. 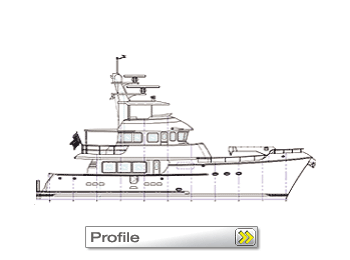 Each thru hull to have a clearly visible tag indicating use. 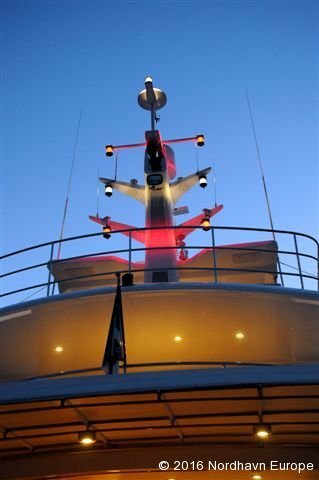 Restricted maneuverability lights – #55000 x two (2), all around red. 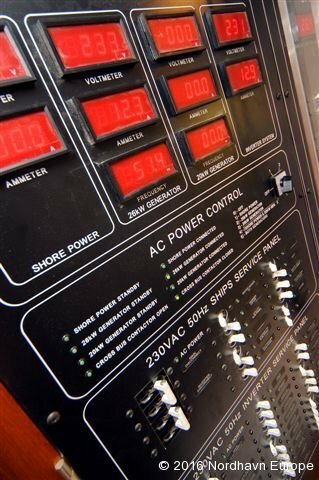 24 volt.